Some places resonate with me much more than others. I’m not always sure why or what the deciding factor might be, but when I stumble upon a unique landscape that gives me goose bumps, I know I’m some place special. 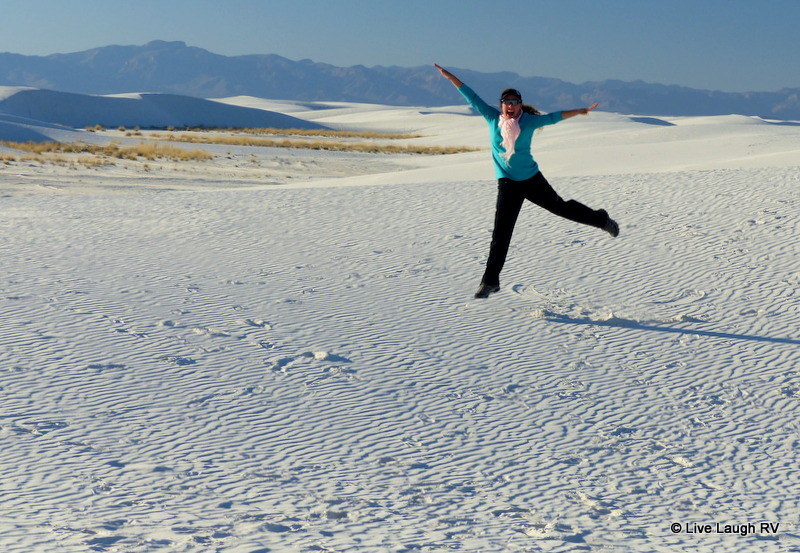 The blogosphere is one of my favorite venues to search and find exciting travel ideas. The moment I saw a photograph of those cone-shaped tent rock formations, I knew this was a must see. A visit was in the plans last year, but when our daughter decided to move from Denver to Phoenix, all those plans went out the window. 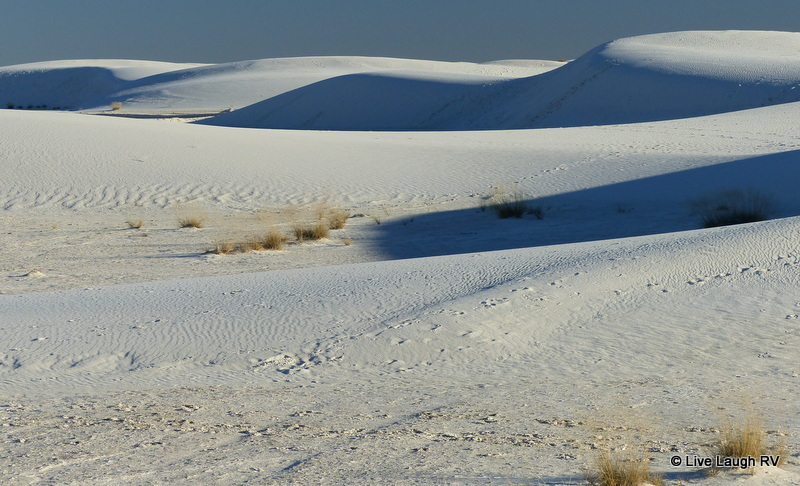 This year was different, and since we didn’t have any firm commitments after mid August, I knew the timing was perfect to lay eyes on this unusual landscape. 35 miles south of Santa Fe, New Mexico, is a complex and unique geological landscape called Kasha-Katuwe Tent Rocks National Monument. This relatively new monument was designated as such in 2001. The sculpted cliffs and peaked hoodoos were formed from volcanic eruptions that occurred more than six million years ago. There is a somewhat uniform layering of volcanic material causing bands of white, grey, beige, and pink colored rock. It’s a fascinating and perplexing sight. Over time, wind and water sculpt these rocks creating canyons, scooping holes, and contouring hoodoos. Mother Nature’s artistic and creative hand had me awed and smiling during the entire two plus hour hike. I found myself hiking this fun trail several times during our two-week stay in the Santa Fe area, and trust me when I say, once is not enough. I already look forward to returning. Without further adieu, let’s take a hike…..
As we approached the fee booth station, we were greeted by a ranger. There’s a $5.00 daily fee (as of Aug 2016) or free with your Annual National Park Pass (this is a Federal park after all). From the fee station, we continued for five miles down a paved road that crosses private property owned by the Pueblo de Cochiti. We are asked to respect the traditions and privacy of the local Indians and thus, no stopping along the way, no photography/video, and no drawing/painting. Also, no commercial photography within the park is allowed without a permit. 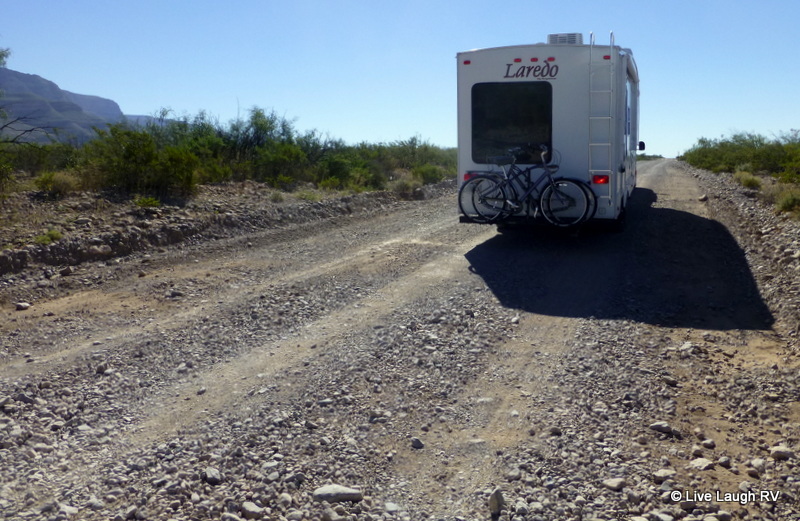 Once we neared the trailhead, there were three different gravel parking lots that can accommodate just about any size vehicle (including RV’s). There’s a couple of vault toilets, but no water….. so be sure and bring plenty of drinking water. You’ll need it. Unlike most national parks and monuments, there are no scenic overlooks near a parking lot around here. The only way to view the tent rocks and observe this stunning landscape is by foot; hiking via a dirt, sometimes sandy trail. And by the way, no dogs allowed. You won’t even be allowed through the fee station with a dog in the vehicle. The 1.2 mile Cave Loop Trail is rated easy and partly handicap accessible. There are some unique rock formations and a hand dug cave along this trail, but the real gem of the park is the Slot Canyon Trail …… definitely not to be missed. The Slot Canyon Trail is a 3 mile out and back hike with a 630 foot elevation gain and connects with the Cave Loop Trail. We hiked the combination of both trails making for a wonderful 4.2 mile hike that, for my level of hiking ability, offered me the perfect amount of challenge and visual stimulation. The moment we connected with the Slot Canyon Trail, the cliff walls rose on both sides and I felt like I had entered a secret garden of sorts. I believe, oh my gosh, was uttered by me around every bend. 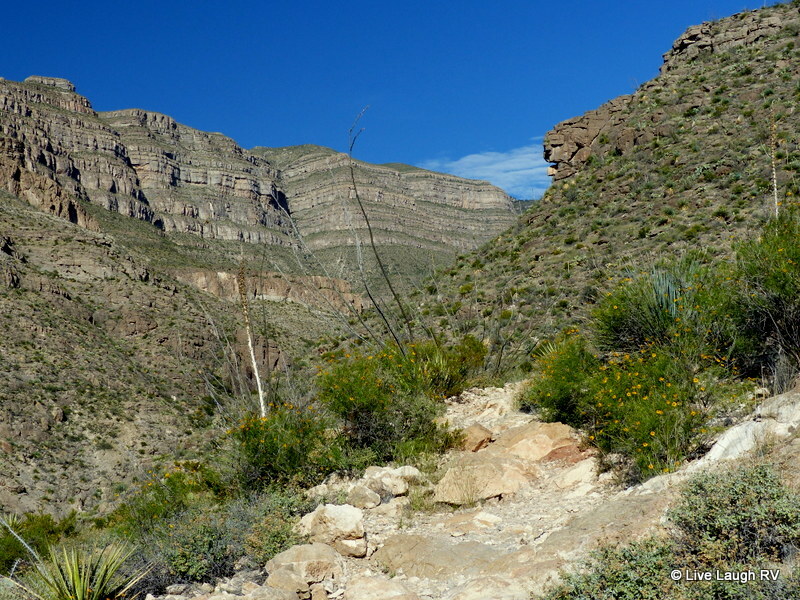 As the canyon walls continued to narrow, we were greeted with obstacles along the trail. Nothing we couldn’t handle … however, those that are vertically challenged or suffer from short leg syndrome, like moi, may find themselves stretching out those leg muscles just a tad. At some points the slot canyon became very narrow, so narrow that there was only room for one foot at a time. one foot at a time! one hiker at a time! Once we exited the slot canyon, we were welcomed by those tee pee shaped hoodoos …. each uniquely sculpted by the elements and each equally as impressive. It didn’t take long and we could feel the trail climbing and instead of looking up at the amazing tent rocks, we were now looking down upon them. We continued up the trail and stopped frequently to look back. As we reached the top of the trail, we had temporarily hiked away from the tent rocks. The trail continued out onto a narrow mesa which provided a bird’s eye view of Kasha-Katuwe Tent Rocks National Monument. And of course, a few more “Oh…. my…. gosh”es were uttered as I stood on the edge gazing down. Standing on the edge gazing in awe! We can see hikers on the trail. Since this is an out and back hike, we’ll be down there shortly! Not an obstacle I couldn’t handle on my own! The return hike to the trailhead was every bit as amazing as it was entering. The Pueblo de Cochiti people view Kasha-Katuwe Tent Rocks as a very special place and justifiably so. After Al and I made this first hike, I returned three more times to tackle this perfect (in my book) hike. Perfect – even when considering all the obstacles one might bump into. Oh no, someone wasn’t paying attention! At least I managed to stop the blood from running down my leg. 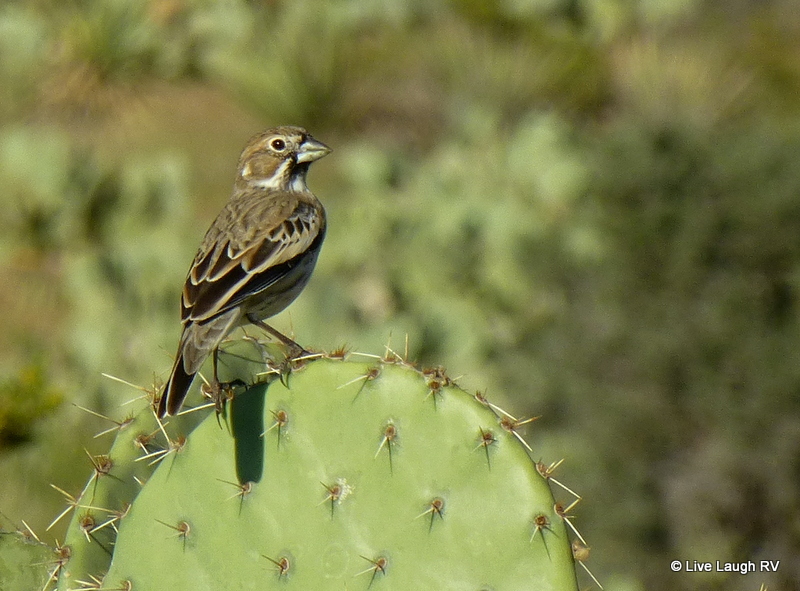 I did attract a little attention from fellow hikers…. You know, those “Are you ok?” looks and comments. One morning, I hit the trail at 8:15 and encountered only one couple on the trail for that first hour. It was awesome having this amazing place to myself and hiking in solitude. All of my senses were alert. The visual delight of the sun peaking from behind a rock was a reminder of a new day unfolding. I listened to the light sound of a lizard moving, and the loud squawking of birds soaring overhead. I breathed in the crisp clean air scented of pine. There was the random sound of tiny rocks tumbling, acting as a reminder that this land is in a constant state of change. There was the occasional touch of admiration and respect for this special and sacred place. Yes indeed, some places touch my soul more than others and Kasha-Katuwe touched mine more than I ever expected. I know I’ll return! When we hit the road in the RV full-time almost three years ago, we weren’t sure what to expect or if we’d have any regrets. Considering we sold the house and moved into the RV on a whim and all within ninety days of deciding to do so, one can’t help but wonder, “Whatever were we thinking? But it’s those hidden gems, those unexpected discoveries that have Al and me wanting to keep those wheels on the RV rolling. The first time we pulled into City of Rocks State Park, I was giddy with delight. This time was no different. There’s something surreal and unworldly about this place. It’s all about the rocks… it’s a rock thing. While hiking around City of Rocks State Park, voices swirled in my head, “Danger, Will Robinson, danger!” I know, I’m dating myself, but I couldn’t help thinking what a fabulous location this would make for a Lost in Space episode. It really did feel like I had stepped onto another planet. Around every corner was another fascinating rock formation, another cluster of interesting shapes accompanied by a multitude of color and light. I’m afraid I could wear out the use of the word unique around here. How about dazzling, splendid, delightful, superb, appealing, awe-inspiring …… ? We are in site #1, first RV on the right. It’s the shortest electric site. 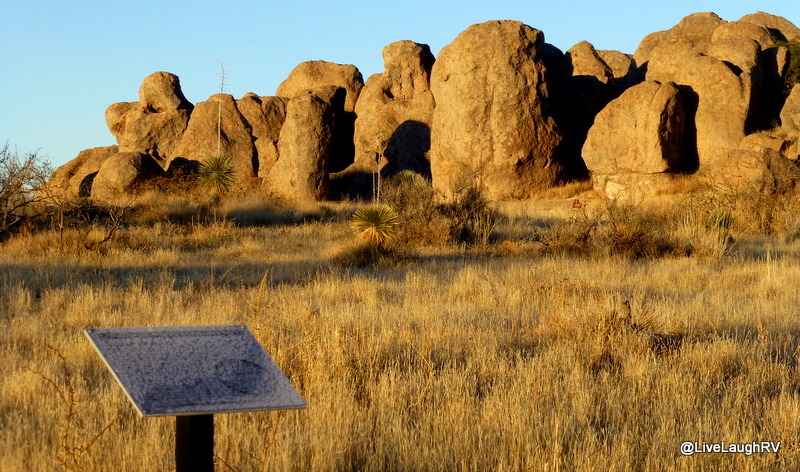 Since we didn’t have a reservation….. as a matter of fact, we made the decision to overnight at City of Rocks State Park while driving through Las Cruces, New Mexico, only an hour away. Remember in my last post when I talked about flexibility? When Al and I are transitioning between locations or reservations, we have a tendency to wing it and find ourselves changing our minds numerous times. 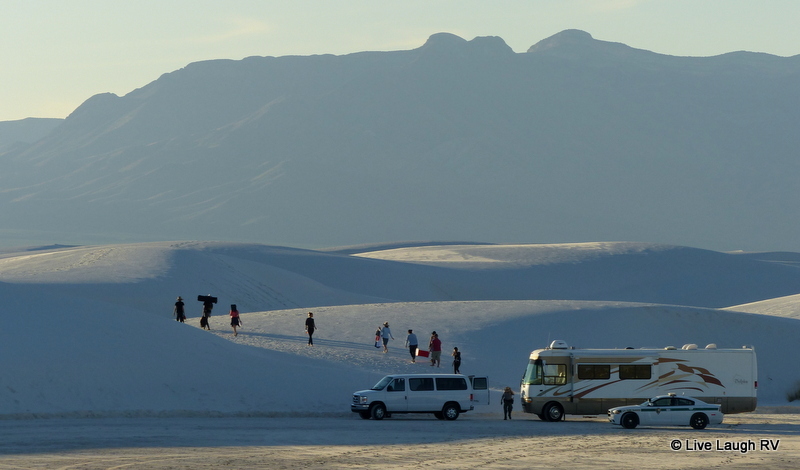 The original plan was to do a quick overnight at a RV Park in Deming, New Mexico, but how boring is that? So at the last minute, we decided to go someplace fun and maybe stay a couple of days, considering we were running ahead of our loosely planned schedule anyway. But we needed to ask ourselves, what if all the electric sites were taken? 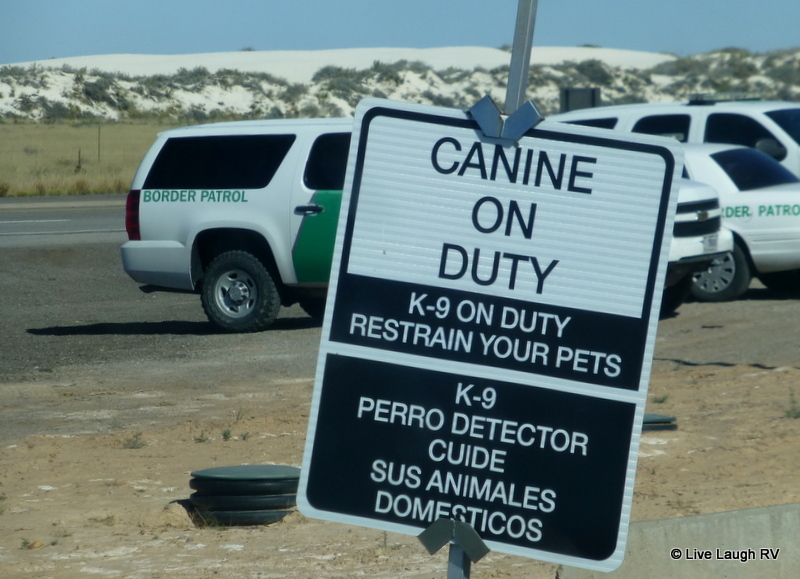 After all, we were driving thirty miles out of our way – 60 miles round trip back to interstate 10 and the town of Deming, NM. We always have a backup plan and sometimes a backup to the backup. 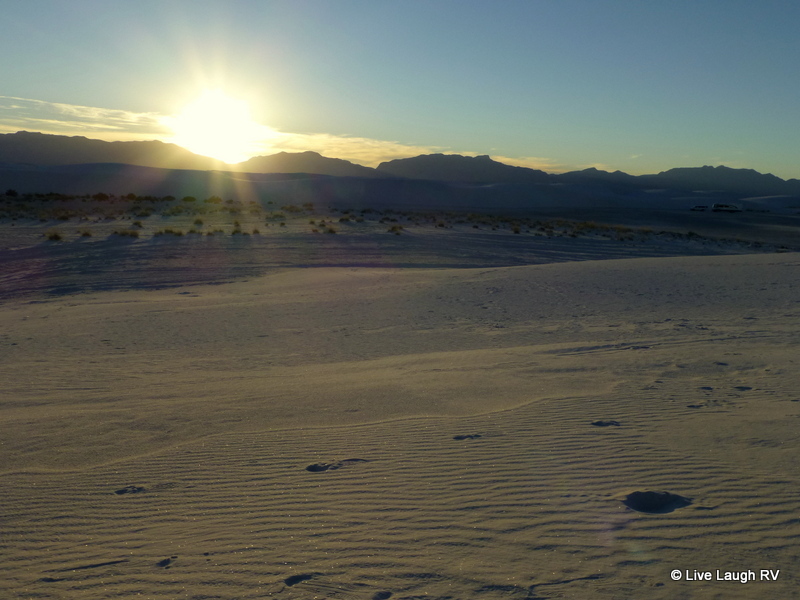 One of the backup plans was to pick out an awesome dry camping site – and they are one-of-a-kind, unique, and awesome – but with freezing overnight temperatures predicted, dry camping was our last choice regardless of how distinct and amazing the dry campsites are. 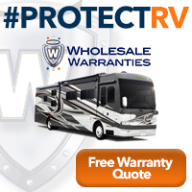 I wanted to run that RV furnace to my heart’s content without worrying about the RV batteries or running the generator like crazy. We pulled into the loop that offers electric and water hook-ups around 1:00 in the afternoon and snagged the last electric site available. 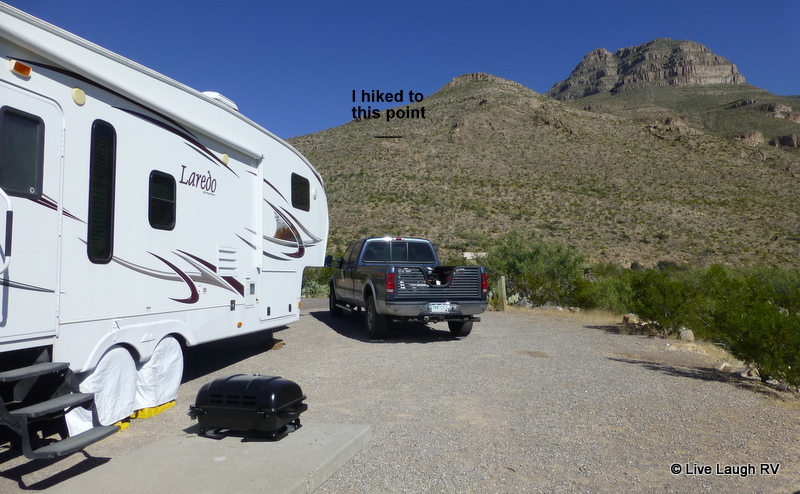 Site #1 is rather short and required us to unhook the truck from the 5th wheel. We didn’t mind and were thrilled we procured an electric site. Although the intention was to stay a couple of nights, I paid for one just in case we changed our minds, a gals prerogative ya know! And remember, state parks don’t give refunds. a sweet spot to call home… for a bit, anyway. I absolutely love City of Rocks State Park, and it’s these kinds of discoveries that have me living in the RV full-time with NO regrets. However, this was February, aka winter, and with daytime temperatures barely reaching 50 degrees Fahrenheit and in the 20’s overnight, we decided to hook up and move on the next morning in search of warmer weather. Hmm, have we turned into winter wimps? a pull-thru dry site on the left. By the way…. 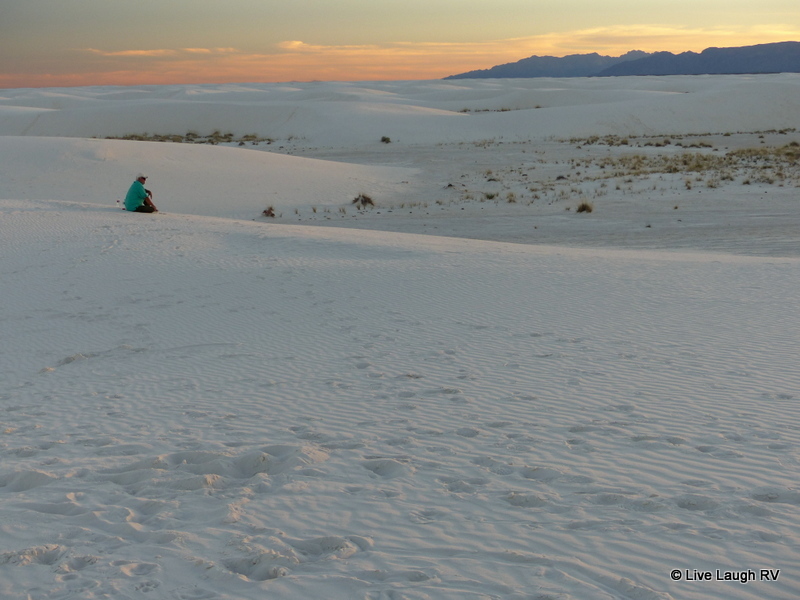 White Sand Dunes National Park is another unique New Mexico site not to be missed. However, for those looking for an experience a little less remote, Santa Fe and Taos are definitely worthy of a little exploration. 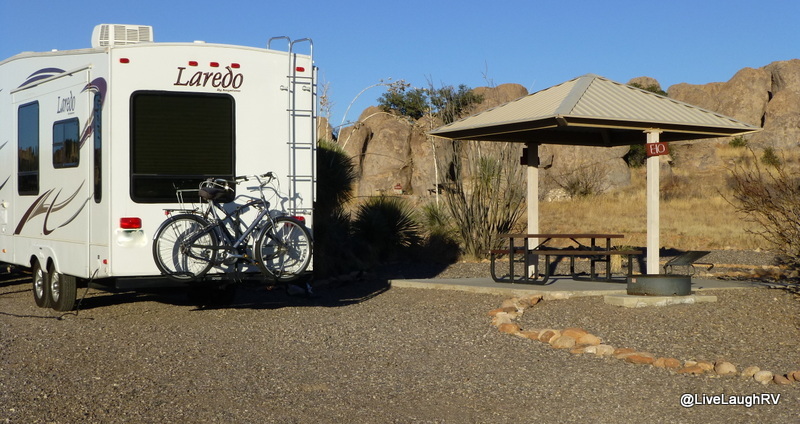 Set against the Sacramento Mountains in New Mexico sits a quiet camping oasis called Oliver Lee Memorial State Park. 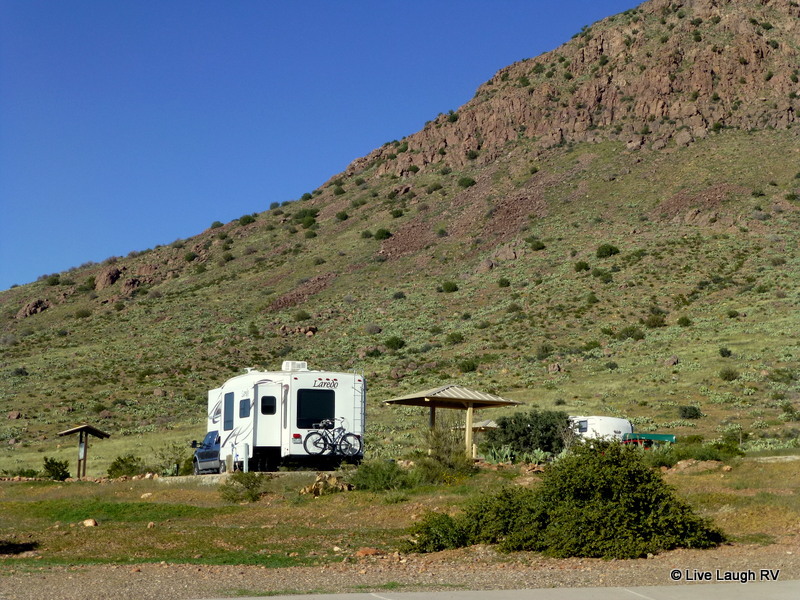 This rustic campground served as the perfect home for us during our Alamogordo, New Mexico, explorations. 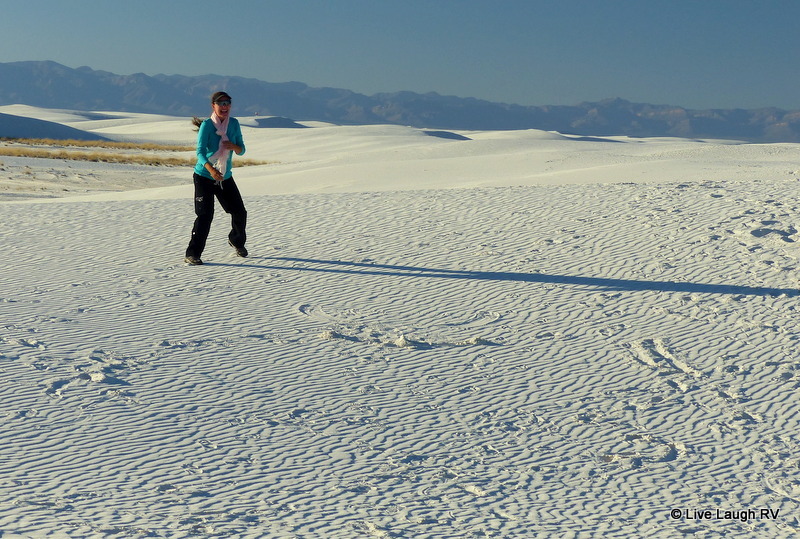 This open year round 640 acre park is located just 15 miles (25 Km) south of the town of Alamogordo, New Mexico and 27 miles (43 Km) from the White Sands National Monument. 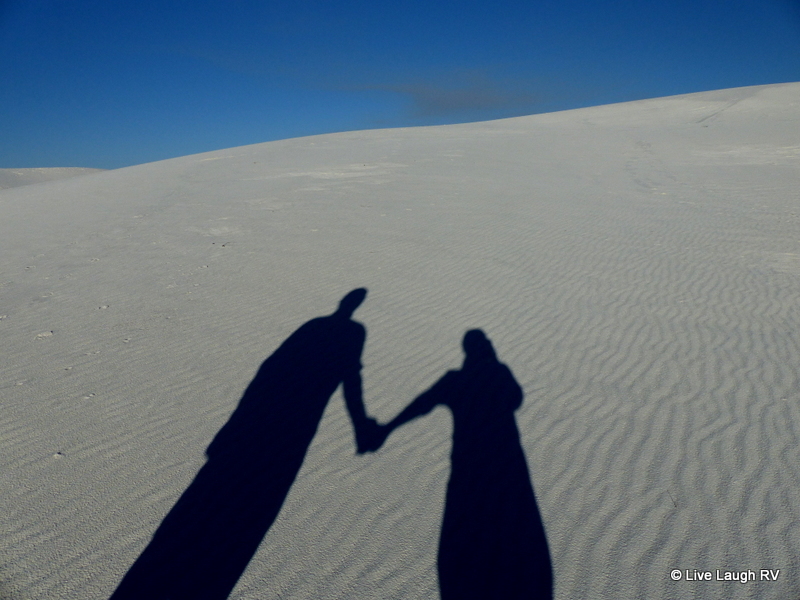 Not only was it convenient for us to visit the dunes at White Sands National Monument from this location, the on site hiking trails were quite enjoyable. 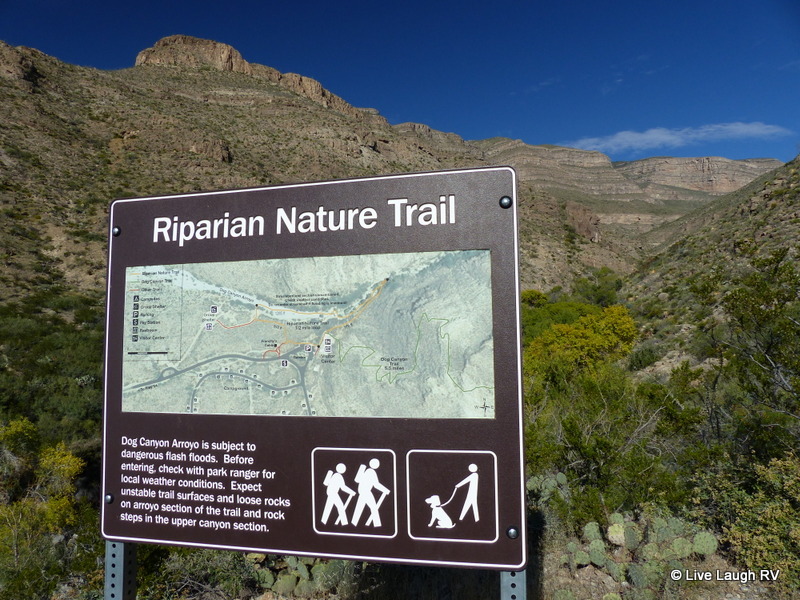 The Riparian Nature Trail is an easy hiking trail that meanders within the Dog Canyon along a trickling creek. The constant source of water flowage year round is a rare treat considering the area receives less 12 inches of rain a year. 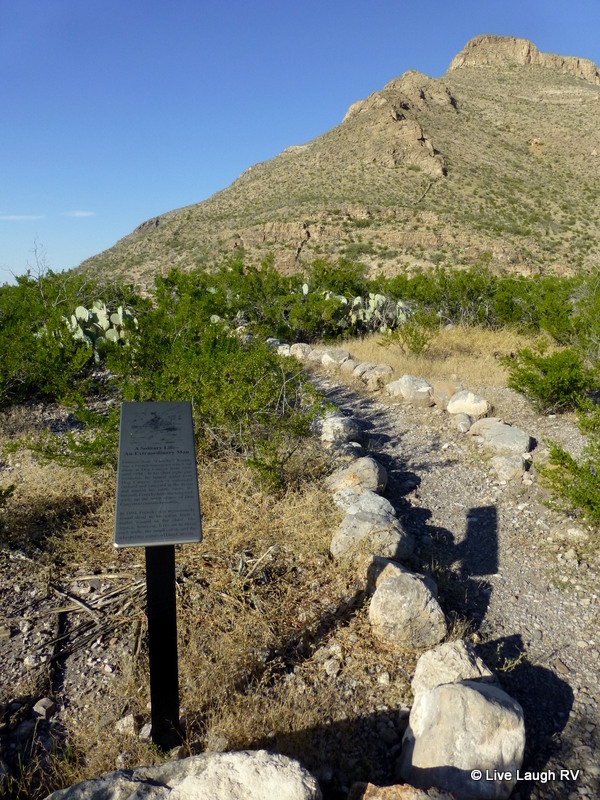 Along the way are unusual natural plants and a historical marker …. remnants of a solitary life long ago. 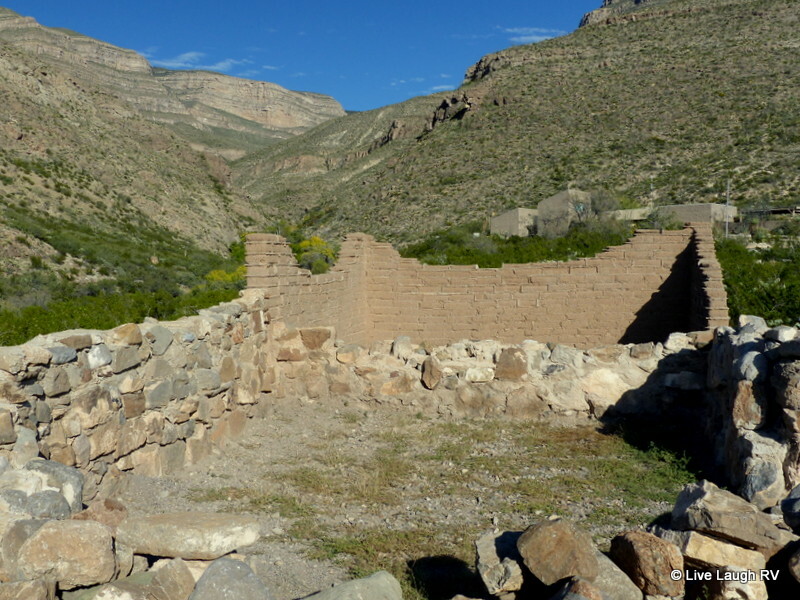 Francois-Jean Rochas, aka Frenchy, was a French immigrant who lived alone at Dog Canyon from 1886 -1894. In 1894, Frenchy was mysteriously found dead in his cabin from a gun shot wound to the chest. His legacy lives on in these walls – Frenchy’s cabin. 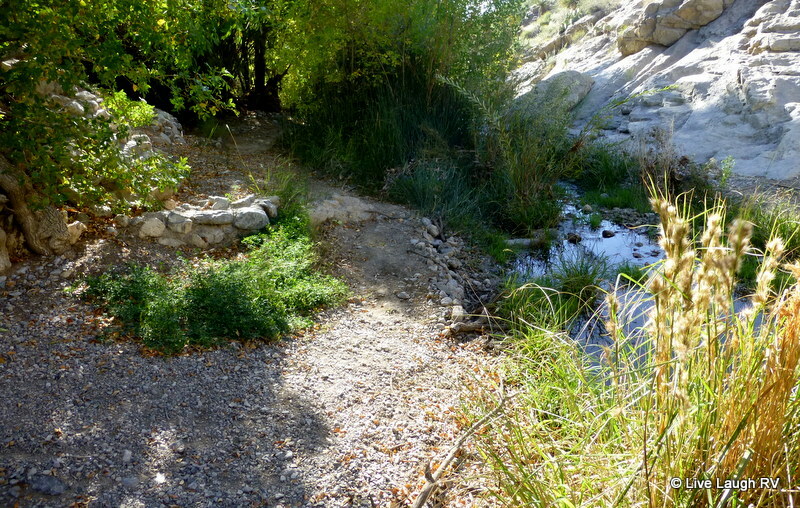 After my stroll on the Riparian Trail, I started UP the Dog Canyon National Recreation Trail. This is a 5 1/2 mile one way challenging trail (round trip 11 miles). 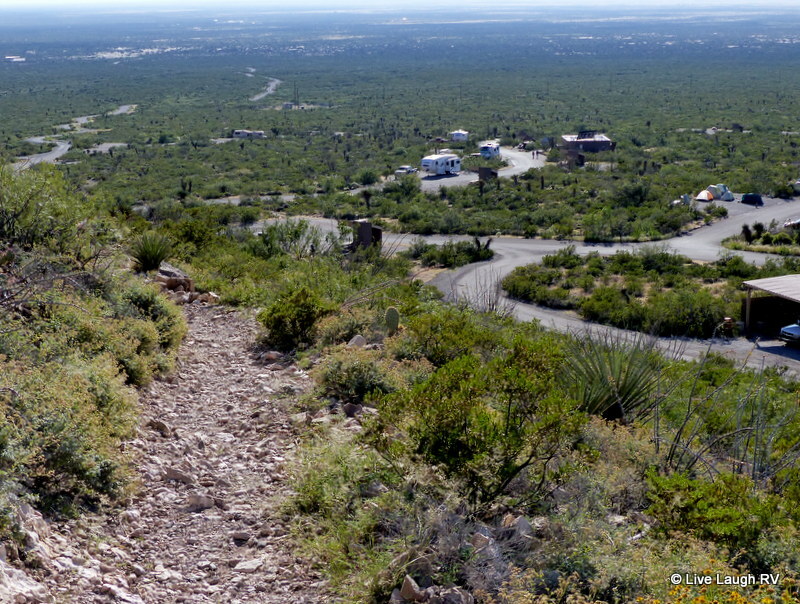 The trail rises about 3,100 feet and offers spectacular views of the Tularosa Basin and Lincoln National Forest. It was getting late in the day when I embarked on a “stroll” and I did so without water or phone (plus I didn’t let hubby know where I was going …. well, I told him one thing, but did another – quite normal around our household 😉 ) That said, I only climbed as high as indicated in the photo below. I would’ve loved to have gone further and if we had stayed another day, you can bet that trail would’ve been on the agenda ….. ah, most likely somewhat abbreviated though. So what did we think of Oliver Lee Memorial State Park? Overall we enjoyed our stay very much, but do note many of the sites will need some assistance in the leveling department. This was the first time in months I had to work some magic to get us level. By raising the stair side of the RV to level up meant that bottom step made for a good glute workout. Certainly higher than normal. that first step makes for a good glute workout! There’s a total of 44 campsites at Oliver Lee but only 7 are reserveable. The rest are all on a first come, first serve basis. 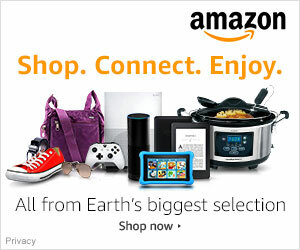 18 sites have electric and some with water. All the sites have nice views and are well spaced. We wouldn’t have a problem fitting our 31′ 5th wheel into any of the sites but larger rigs would need to be a little more site selective or at least experienced with maneuvering. For a more in-depth review you can click here and read Nina’s review on the park. Although, unlike her experience with the showers, we had very little warm water and it was definitely not hot…. tepid at best. Hey, at least we smelled nice after a cold shower! 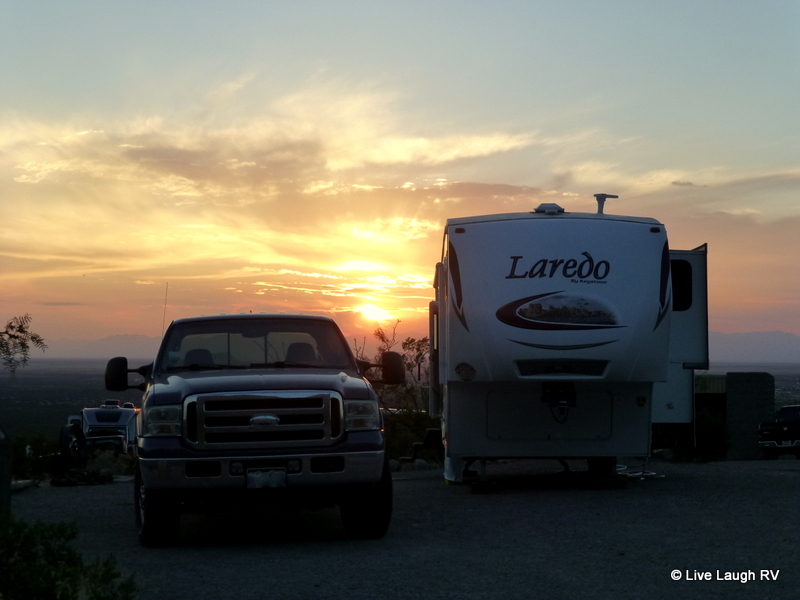 Our second day in Alamogordo, New Mexico, consisted of plenty of wind. Wind around here is normal and expected. 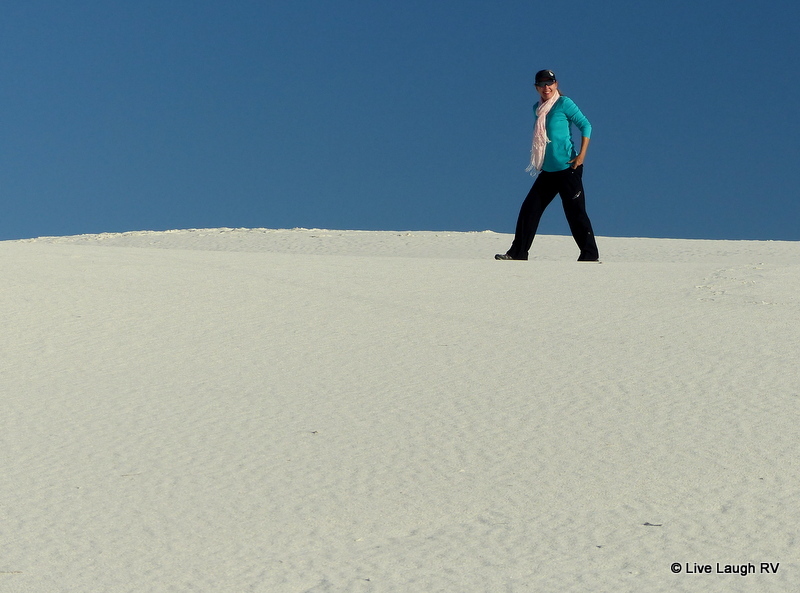 After all, it is the wind that helps form the sand dunes at White Sands National Monument. That’s why I scheduled a minimum of a three-day stay in the area. Weather is not always accommodating. 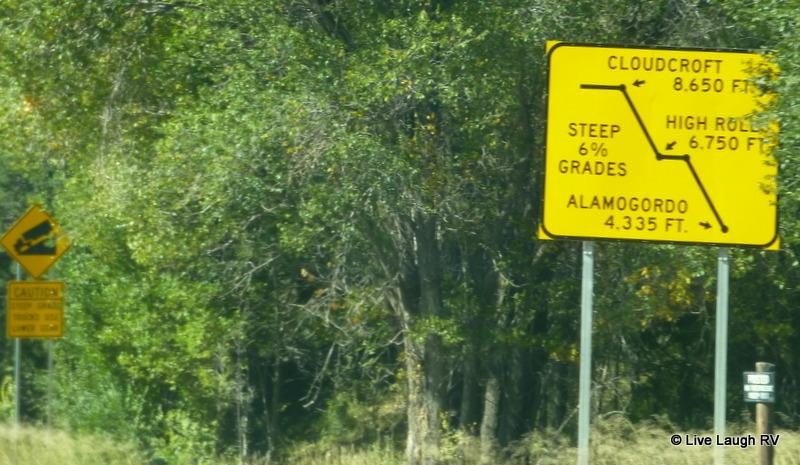 So just for fun, we headed off to the small mountain town of Cloudcroft. Not only did we want to explore this little mountain town, Al and I wanted to check out the road to see if we would be comfortable pulling the RV via this route. 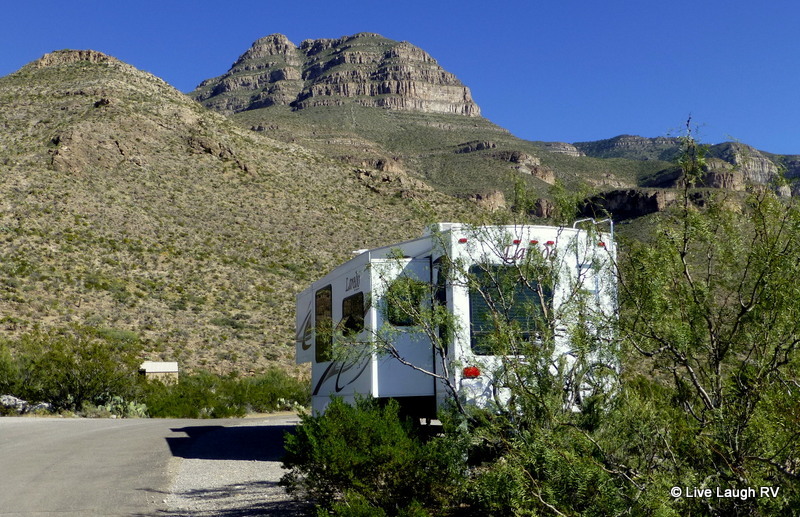 Several folks highly recommended against taking this road with the RV but we’re from Colorado and seem to be a little more comfortable with elevation changes and mountain passes so we wanted to lay our own eyes on the route. Our starting point was Alamogordo, New Mexico, at an elevation of 4,335 feet and our destination was 19 miles to the east. Cloudcroft sits at 8,650 feet in elevation. Thus there’s a 4,315 foot elevation increase in less than 20 miles. Yep, that’s quite the pull and although there was nothing scary or intense about the road, we would probably avoid driving it with the RV just to refrain from straining the truck. Can you guess what day we visited the Lincoln National Forest? 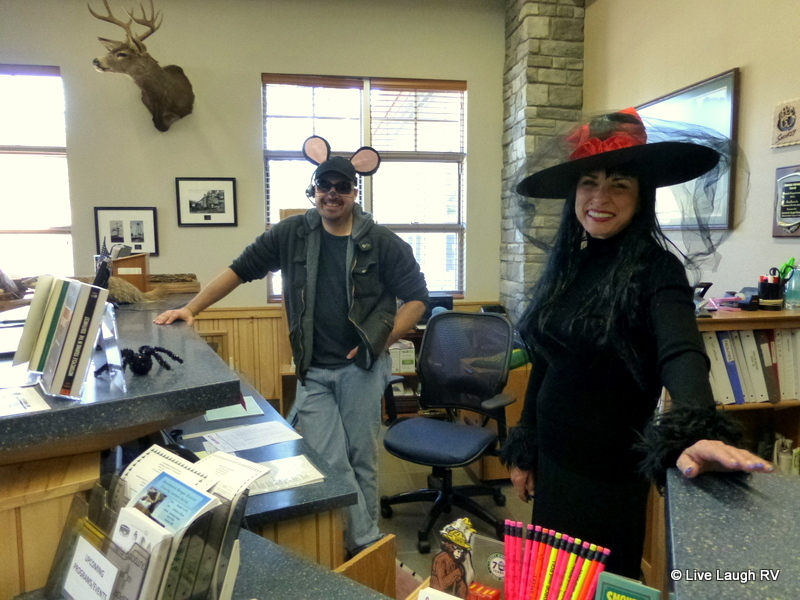 Once in Cloudcroft, we stopped in at the Lincoln National Forest Ranger headquarters (on Halloween I might add) to pick up maps and info on the area. The campgrounds were already closed for the season and it was definitely colder than we anticipated. As a matter of fact, colder than our hoodies would accommodate. A quick drive around town and we were on our way back to warmer temps LOL. 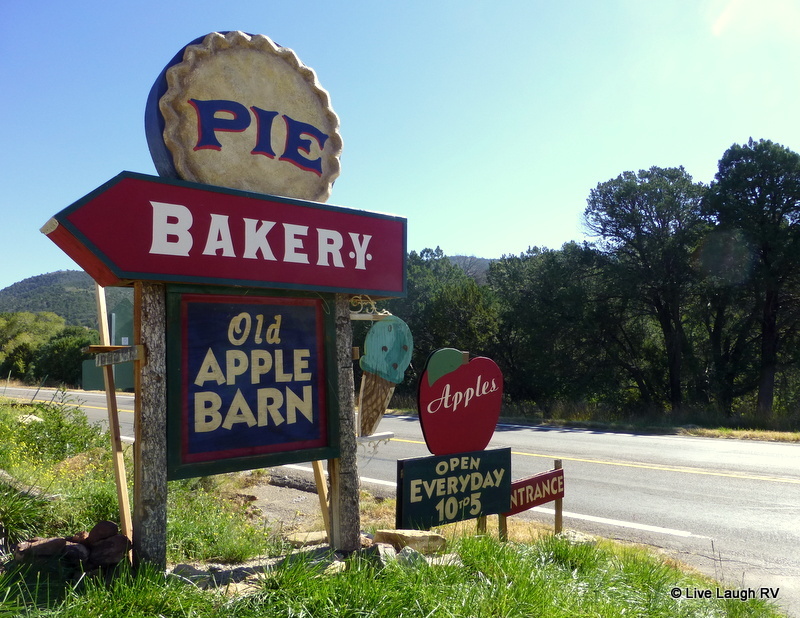 On our return trip, we stopped at the Old Apple Barn. It’s fall and anything ‘apple’ gets my attention. 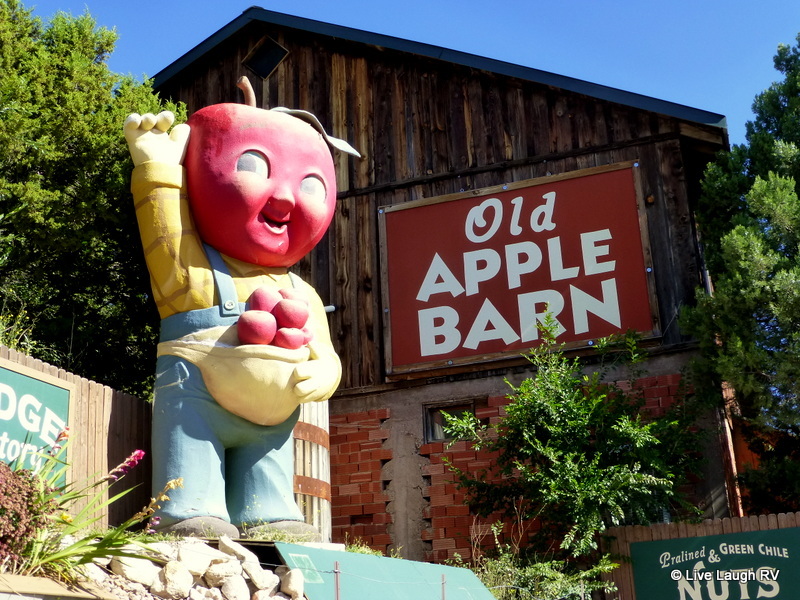 The Old Apple Barn was a fun stop. Hmm, pie and coffee??? Back in Alamogordo our next stop was a pistachio farm. 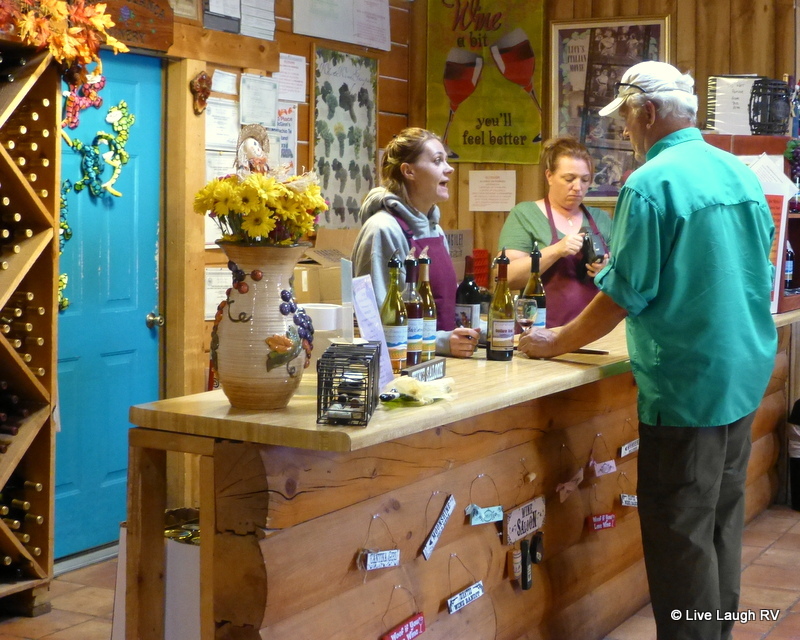 McGinn’s Pistachio Tree Ranch was recommended to us by friends and this too turned out to be a fun stop. There was plenty of sampling to hold our attention. 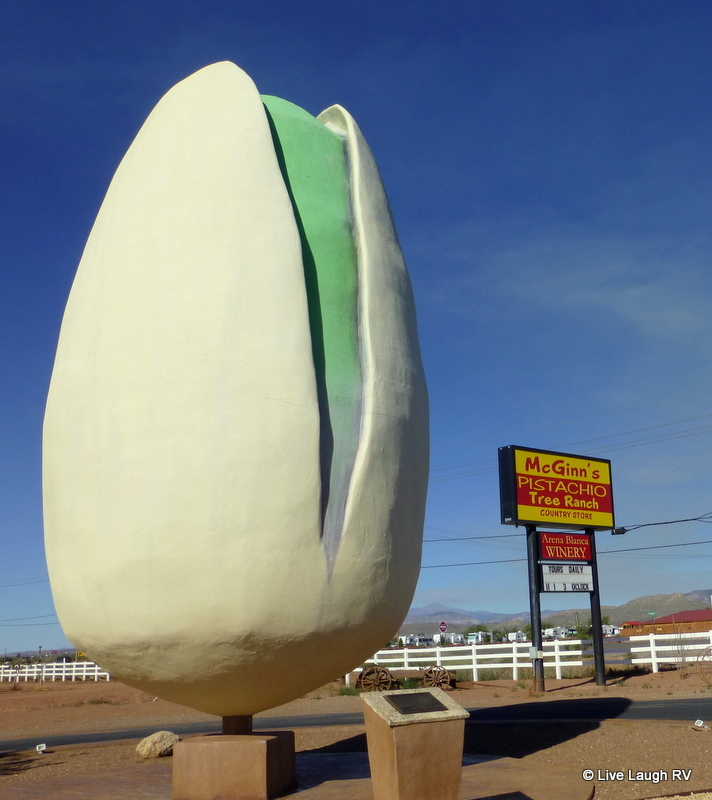 This is one large pistachio! First we started with the sampling of pistachios followed by wine tasting. And of course, there were a few purchases made. 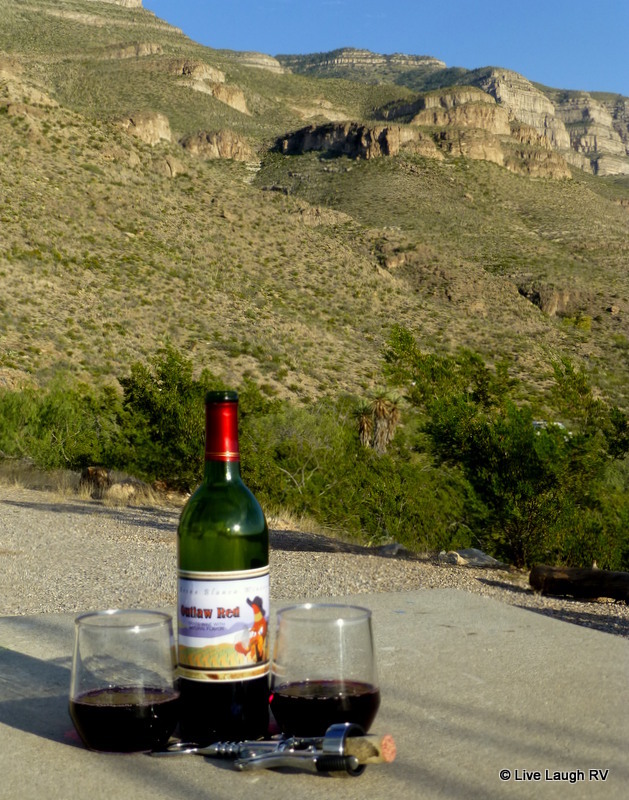 Our friends particularly enjoy the Chocolate infused Cabernet by Arena Blanca Winery and although good, we opted for a bottle of their red wine called “Outlaw Red”. It’s a fruity red that is actually served chilled. Back at camp, we made short order of the bottle of wine and bag of nuts. 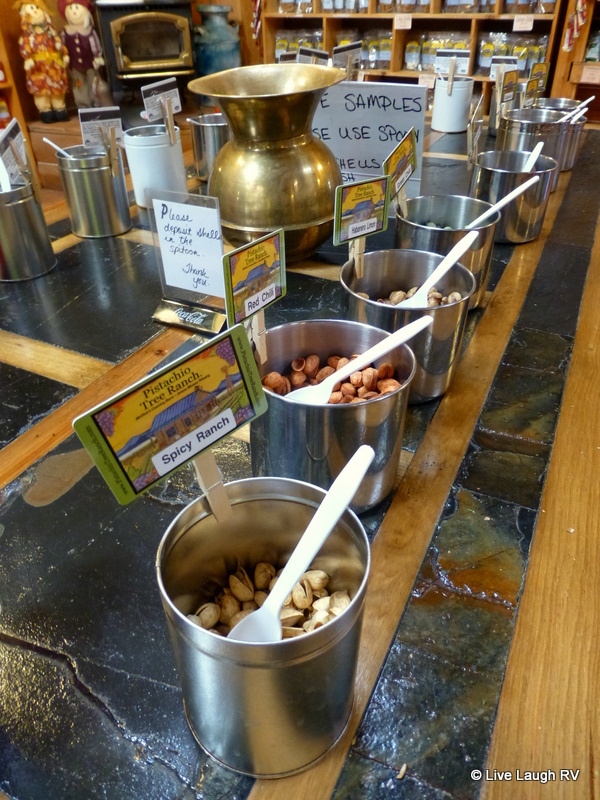 The pistachios turned out to be some of the best we’ve ever eaten and we regret not having bought a larger bag……. 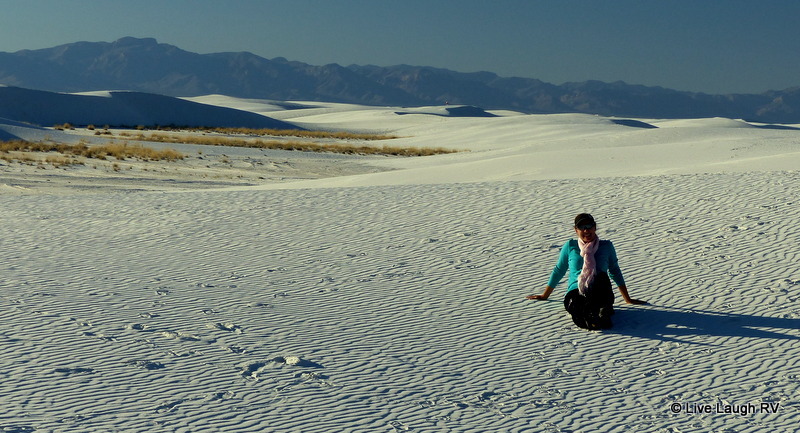 yet another reason we’ll be returning to Alamogordo, New Mexico. 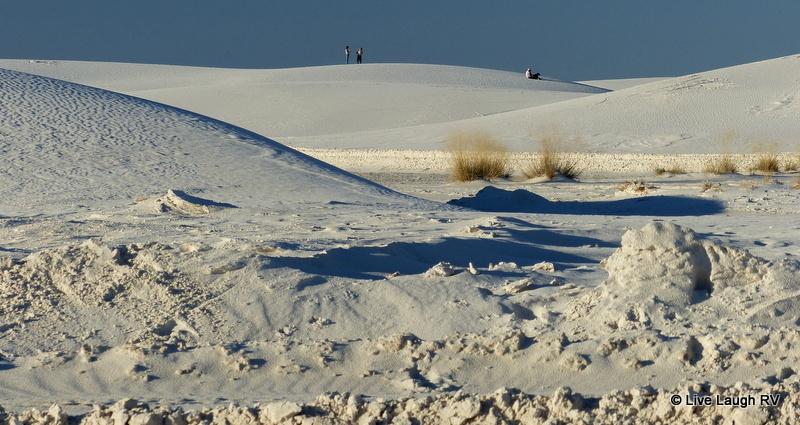 The sands of time; so as time seems to get away from me, what better time to talk about sand dunes…..
Could that be snow? Nope, it’s sand …. sand as far as the eye can see! 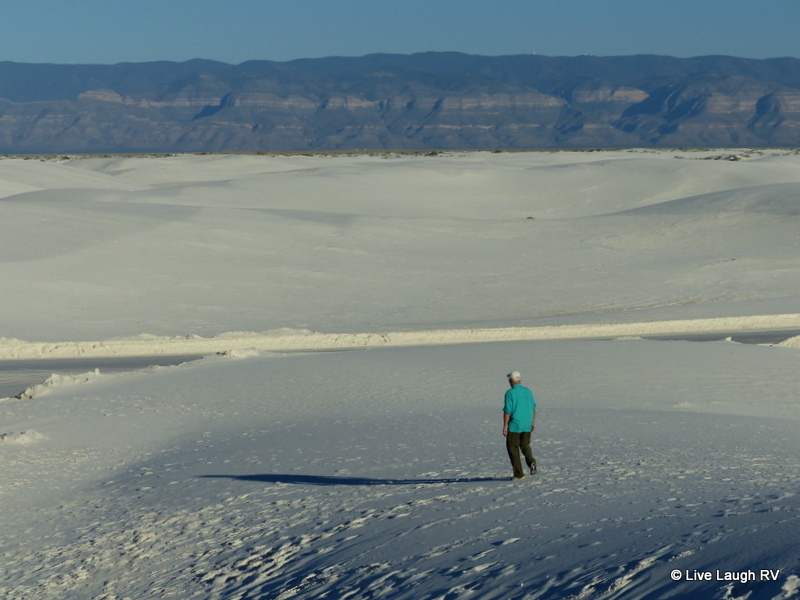 Rising from the Tularosa Basin near Alamogordo, New Mexico, sits the largest gypsum dune field in the world – 275 square miles of glistening brilliant white sand aptly named White Sands National Monument. We entered the monument from the east. 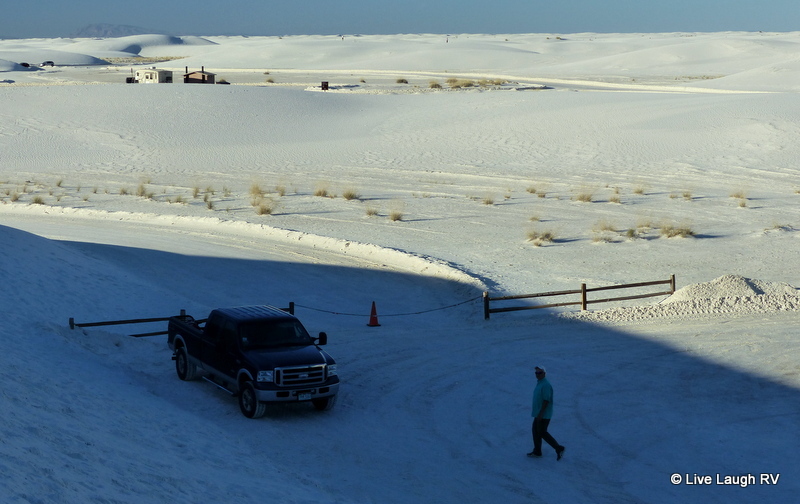 As we continued driving the 8 mile scenic road west, the dunes increased in size; some of which are over 50 feet tall. The vegetation also gets sparser the further west we traveled along with changing sand grains. At the eastern edge the sand grains are very small and round while to the west the sand grains become larger and consist of different shapes. To categorize this place as unique is an understatement. 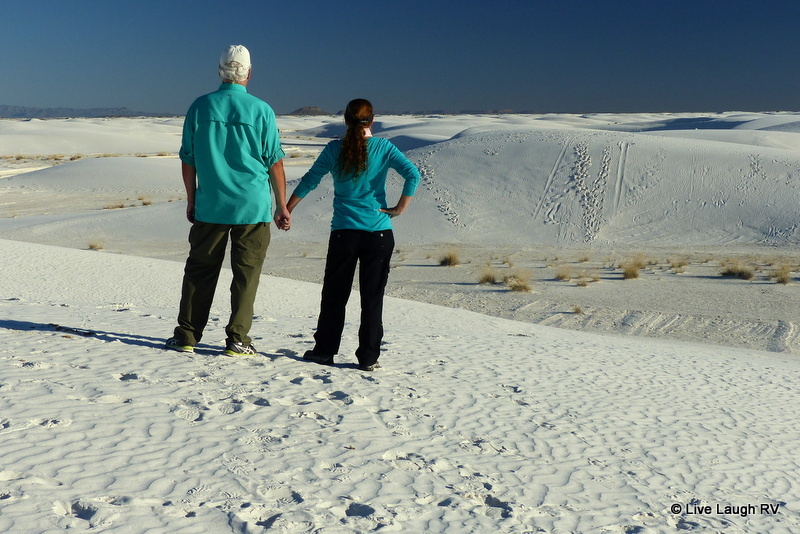 Al and I climb a sand dune and then another. A child like exuberance comes over me. I try making a snow angel and then I pretend I’m walking on the moon. A couple of kids in the distance are sledding. Yep, sledding on sand! You can even bring pooch – leashed of course, which is so unusual since dogs aren’t normally allowed on trails in National Parks or Monuments. A walk on the moon? The sand is cool. It feels like no other sand. And think pooches paws will be bothered by the hot sand? Think again. 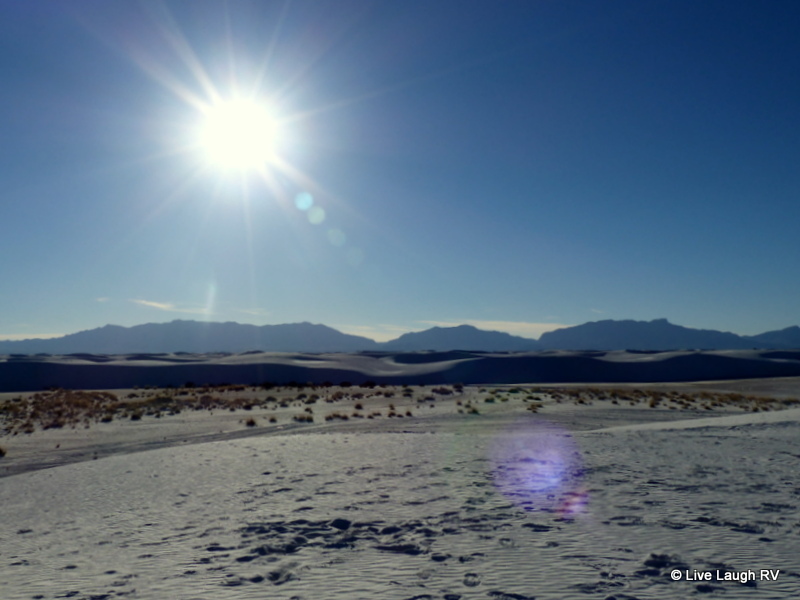 Gypsum does not convert the sun’s energy into heat and thus the sand can be walked on with bare feet even during the hottest of summer months. Al and I are awed by the raw untapped beauty. The vision leaves us speechless and we decide to find a place to sit and watch the sun set. As the sun lowers, we watch a film crew from South America do a photo shoot. Boy, I’d love to see the finished photos of that shoot. November 5, 2014 November 2, 2014 by Ingrid59 Comments on Hildi leads us astray! 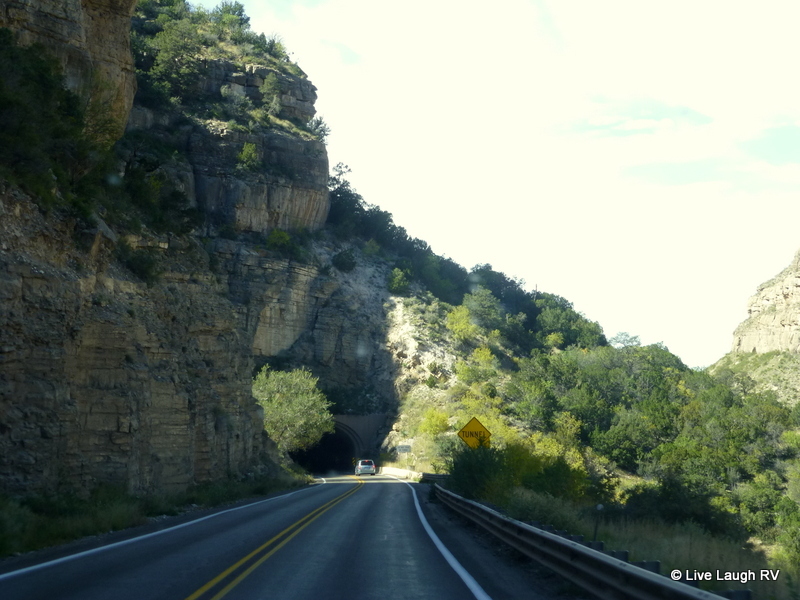 Today’s drive was an easy 2 1/2 hour drive from Deming, New Mexico to Alamogordo NM. However, I wouldn’t categorize it as uneventful. Al has chosen to allow Hildi to do the navigating. Not wanting to get into an argument and second guess the wench, I leave the atlas in the backseat and leave the navigating to her. For those of you new to the blog and not sure who Hildi is you can click here for her story. 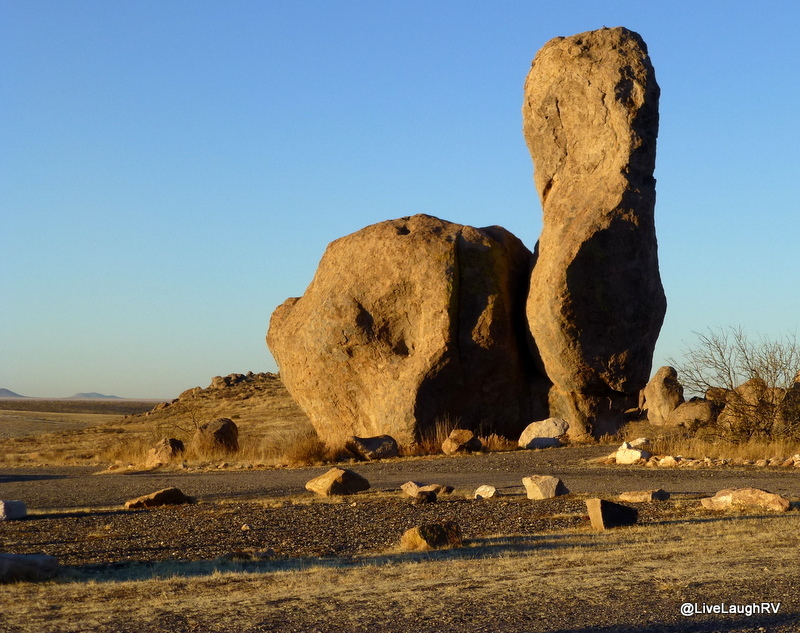 We leave Rockhound State Park in Deming, New Mexico, and continue on Interstate 10 toward the city of Las Cruces. Hildi has us exit the interstate in Las Cruces and pick up Highway 70 where we encounter plenty of stop lights and road construction. Way to go Hildi! Finally we get around the city and we’re headed toward Alamogordo. Traffic is light, winds are calm, and it’s a beautiful sunny day. I can see tuffs of white sand dunes off in the distance. Ooh, my excitement starts to build with anticipation as we get closer to a place I’ve wanted to visit for a very long time. What’s this? We need to stop? Why do these stops always make me nervous? We watch the dog get a little excited around the mini van pictured top right and the driver was told to pull over into that spot. Hmm, wonder what the little doggie smelled. I nervously watch the dog as he quickly moves down the line totally uninterested in us or the RV. Thank goodness. After all, we have Colorado license plates (some places assume since the use of marijuana is legal in the state of Colorado, anyone with Colorado plates is in possession…. not cool). We pull up to a guard and are asked if we are U.S. citizens? We respond, “yes” and are waved on. Thank goodness hubby kept his sense of humor in check and didn’t respond with a “Si, Señor”. I sure would NOT want to find out exactly what kind of sense of humor these border patrol guys have. After the inconvenient stop, we continue our journey and it isn’t long before Hildi has us making a right onto highway 54. So far so good, but then she has us turn left a little too soon in my opinion. There’s no brown sign noting Oliver Lee Memorial State Park and although paved, the road looks narrow – not what you would expect for regular state park traffic. I recommend we not turn and that we shouldn’t trust Hildi. Are you sure you want to trust Hildi? Al turns. We continue down this little residential street and when it ends Hildi has us turn right…. right onto a gravel road. Mind you, we’ve traveled on rougher roads, but this is not what Al or I expected. We eventually make it to our destination: Oliver Lee Memorial State Park. We’re a little dustier and dirtier but no worse for the wear. 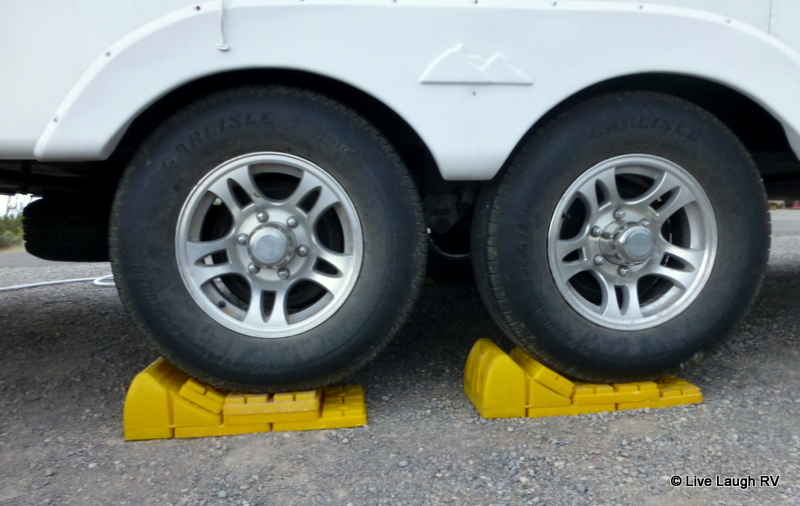 We get settled into an electric/water site with the help of our Lego leveling blocks. I slap together a quick lunch rushing Al. We have some exploring to do ….. I’ll do the driving and we’ll leave Hildi at home! I’ve long wanted to visit this place! “That one looks good”, I say to hubby as I point to the campsite. “Are you sure you don’t want me to drive around the loop?”, he questions. “Nope, looks perfect and level”. Within fifteen minutes we’re all set up in site #25 at Rockhound State Park near Deming, New Mexico. What a pleasant surprise this little state park turned out to be. All the sites are large, well spaced, and most are pretty level. 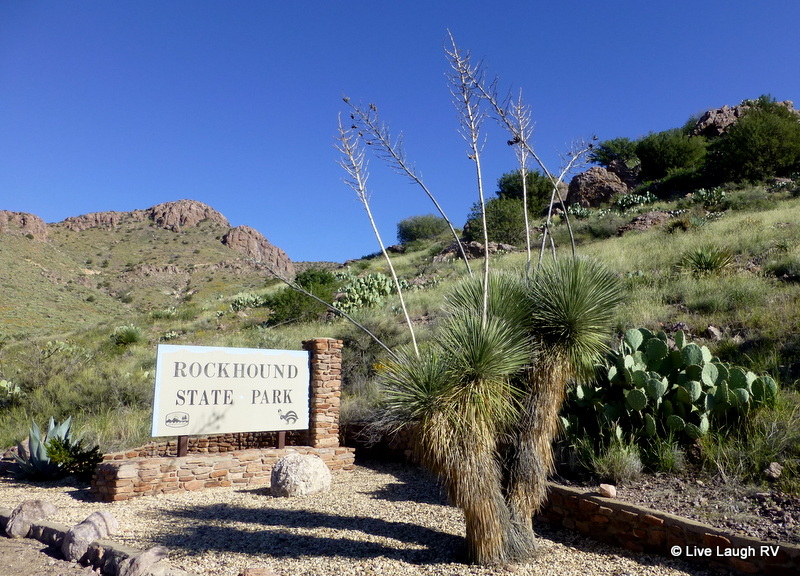 I’ll admit I was tempted to return to City of Rocks State Park as I was so enamored by that place last winter, but that campground is located 30 miles north of the interstate and Rockhound is only 12 miles off the interstate. 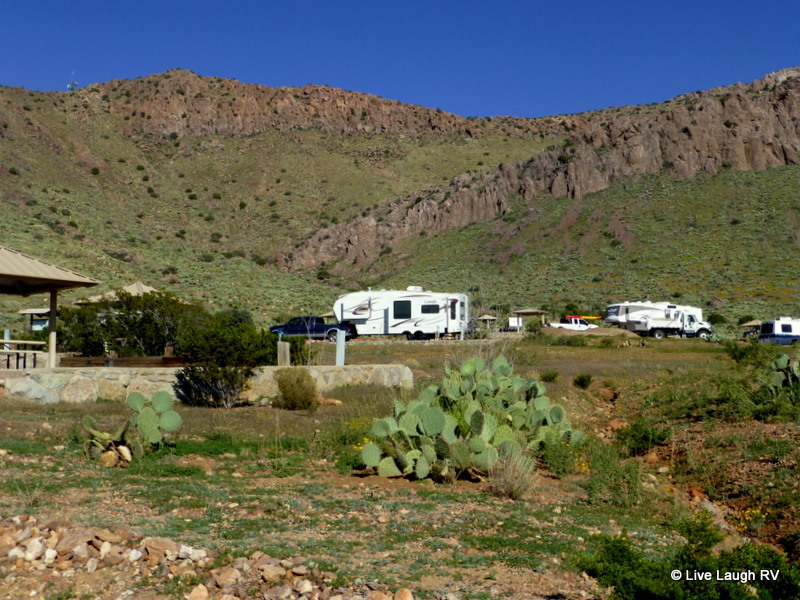 Since we’re only staying one night we even tossed around staying at the Escapees Club Park – Dream Catcher RV Park. 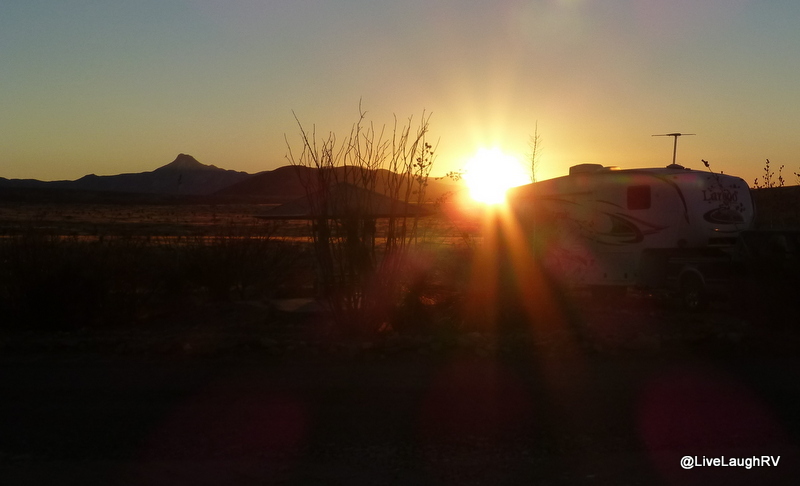 That RV Park is right in the town of Deming making it easy on and off the interstate. But you know me, it’s all about the views…. gotta have those views! I’ll gladly give up hook-ups for views, but here I’ve got views AND electric…. score. While my chauffeur checks out his MacGyver’s handy work to make sure the repairs held together after a 4 1/2 hour drive, I check out the hiking. 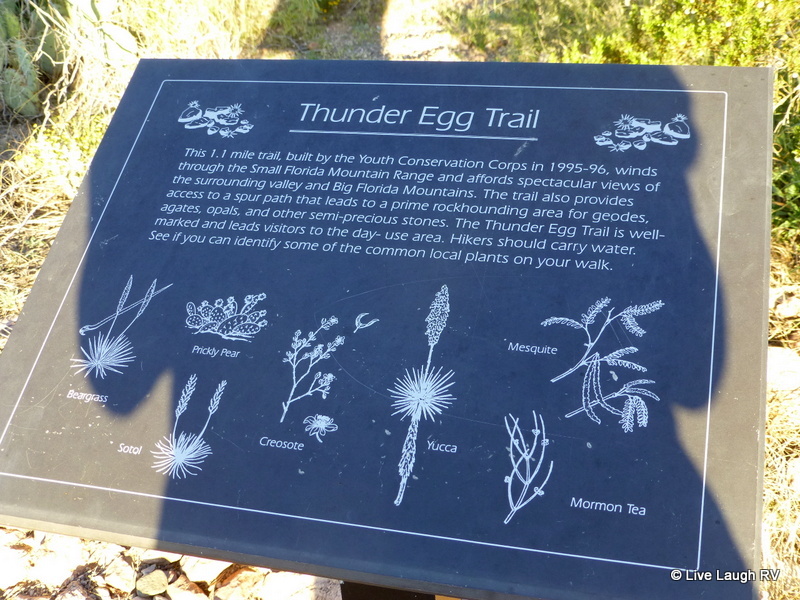 How convenient for us to be parked right across the street from the Thunder Egg Trail trailhead. 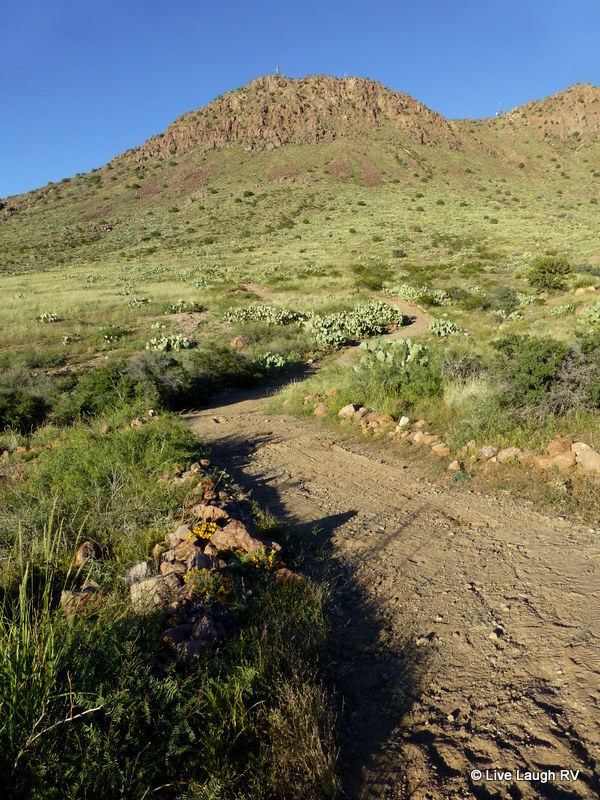 This is an easy 1.1 mile trail that leads from the campground to the day use picnic area. It meanders along the Small Florida Mountain Range. There’s prickly pear in every direction along with various yucca plants. But the main attraction here are the rocks. Folks come here in search of precious gem rocks. The gathering and collecting of rocks is ok and expected. Yep, feel free to help yourself to a few rocks. Personally, I didn’t take even one rock as visions of Lucille Ball in the Long, Long Trailer came to mind. All in all, we loved our one night stay at Rockhound State Park and hope to return for a longer stay next year. 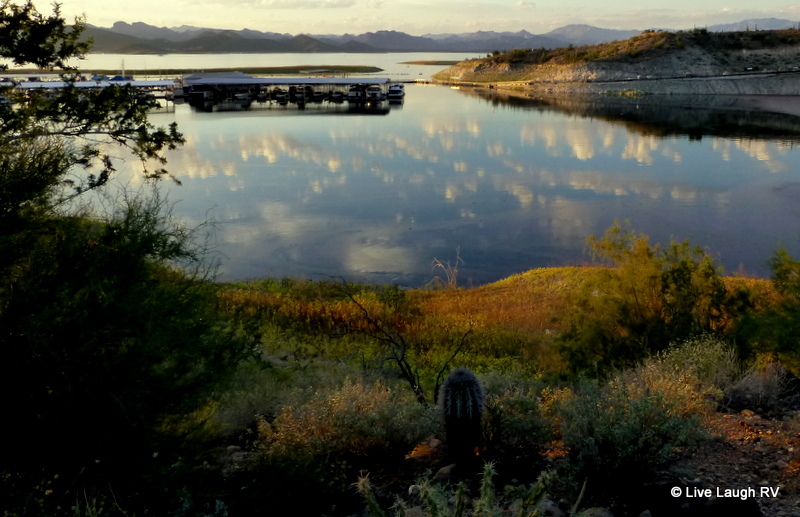 After enjoying yet another gorgeous evening at Lake Pleasant, we hit the road last Sunday morning. Usually I’m excited on travel days because it means we’re off for new adventures, but last Sunday I was engulfed with a sense of paranoia. A feeling of what will go wrong this time. Once the wheels started rolling, I settled in and calmed down. However, several times I did ask Al, “Did you hear that?” or “Do you smell that?” “Stop worrying, Ingrid”. A little over an hour later, we pulled into our friend’s place in Apache Junction. 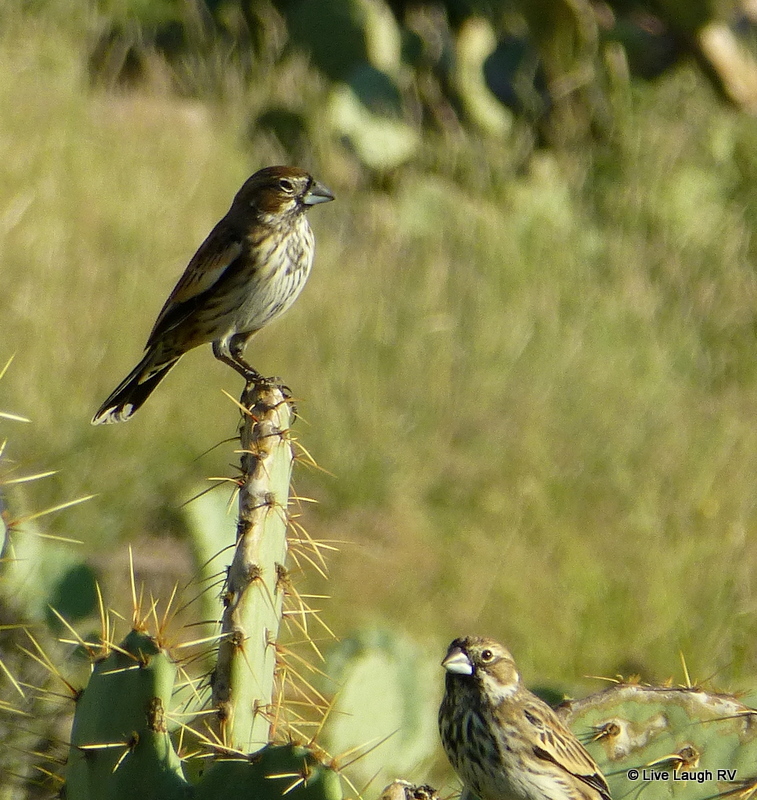 Our travel day took us from the far northwest side of the Phoenix valley to the far southeast side of the valley in the town of Apache Junction. 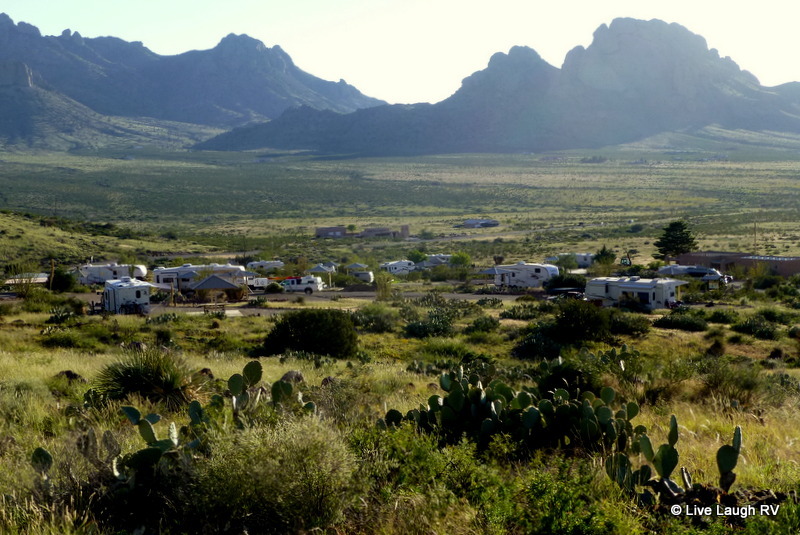 Apache Junction is a favorite location amongst RVer’s. 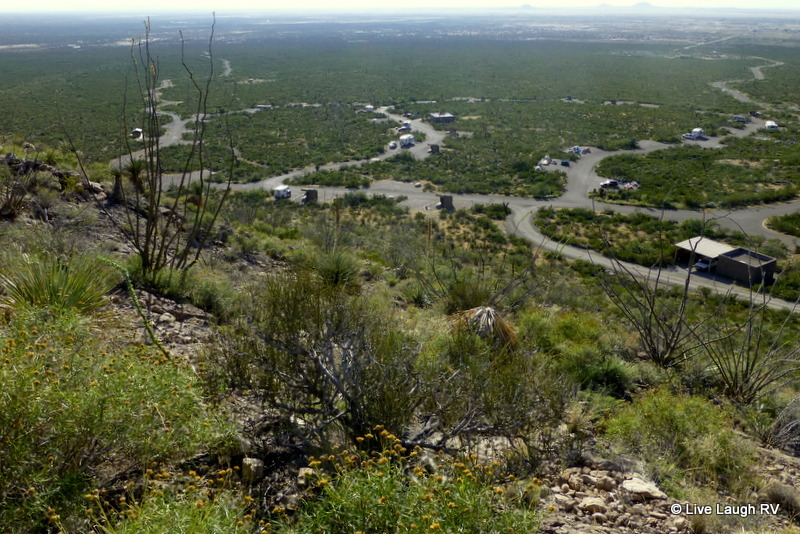 There are more RV Parks than one can count as well as the ever popular Lost Dutchman State Park and Usery Regional Park can be found here. And with the picturesque Superstition Mountain ever present in the background, what’s not to like about this area? We find our friend’s place with ease and are met with open arms. They own a place with a double lot and the second lot has full hook-ups for us. Yippee! While Cheryl and I hug hello, with pointed finger John engages Al in a “what happened there?” discussion. Remember …. a week ago we had new waste lever valves installed? That required pulling down the thermopan (belly cover). Well, the reinstallation didn’t hold up thus the thermopan was dragging on the ground ….. grrr! Looks like our stay with friends won’t be all socializing; it will also entail some repair work. However, we did manage to introduce John and Cheryl to the Organ Stop Pizza. 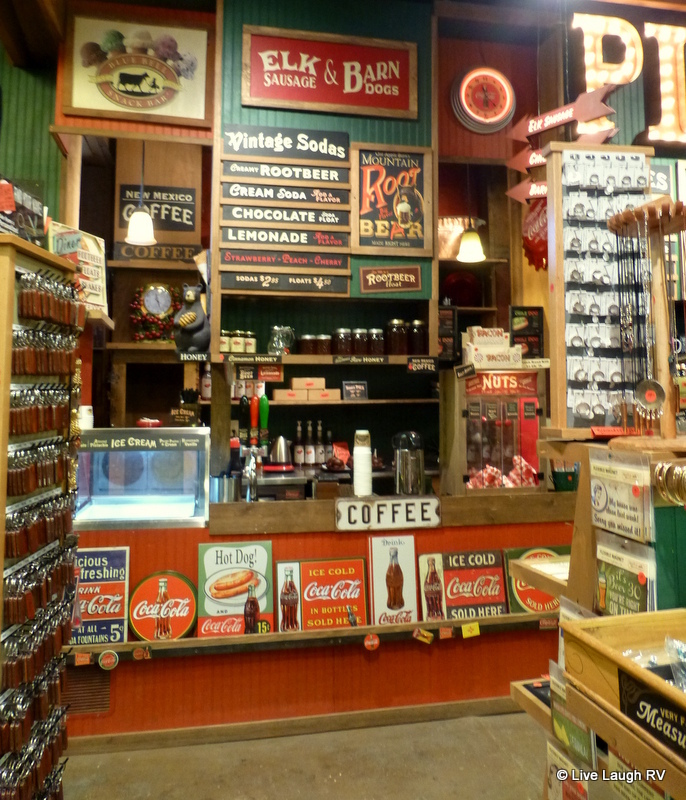 This is one of those must see places during any visit to Phoenix, Arizona. It’s a one of a kind experience and the food is good as well. Definitely worth a visit at least once. And then I can’t forget to mention the lovely evening we managed to squeeze in with friends G & T. Thanks guys for a great meal and wonderful company. After a very busy but short stay in Apache Junction, it was time to get those wheels rolling. 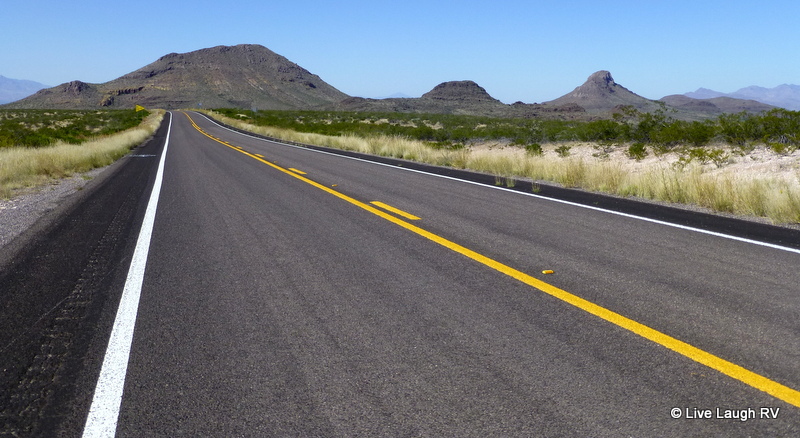 In the past, we’ve always taken Interstate 10 toward Tucson then east toward Texas. This time we wanted to try something different and took two lane Highway 60 east toward the town of Globe. 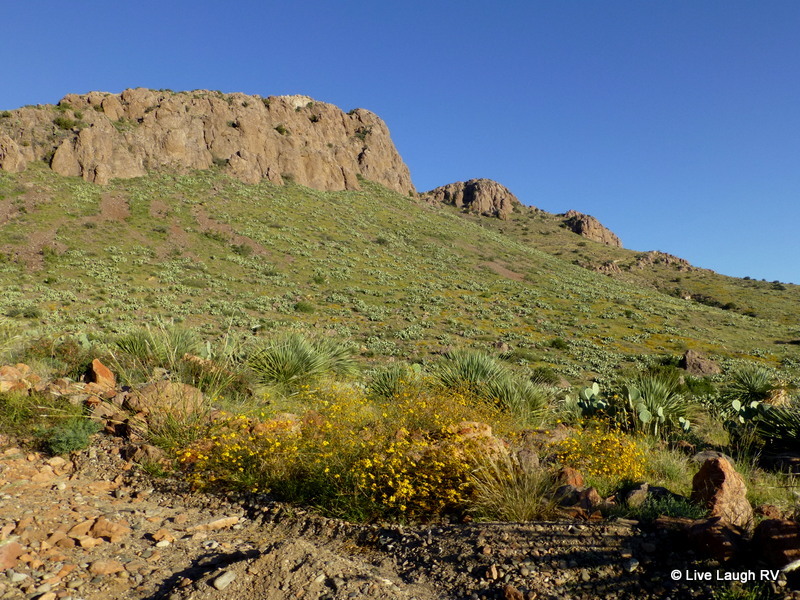 The raw scenic land continued as we picked up Highway 70 which meanders through the San Carlos Apache Indian Reservation. The name Geronimo is most definitely associated with this territory. You can click here for more info about the history or here for the Apache website. While taking in the sights during our leisurely drive, hubby, the history major, briefed me on the atrocities that occurred around here; not exactly a proud moment for the white man. 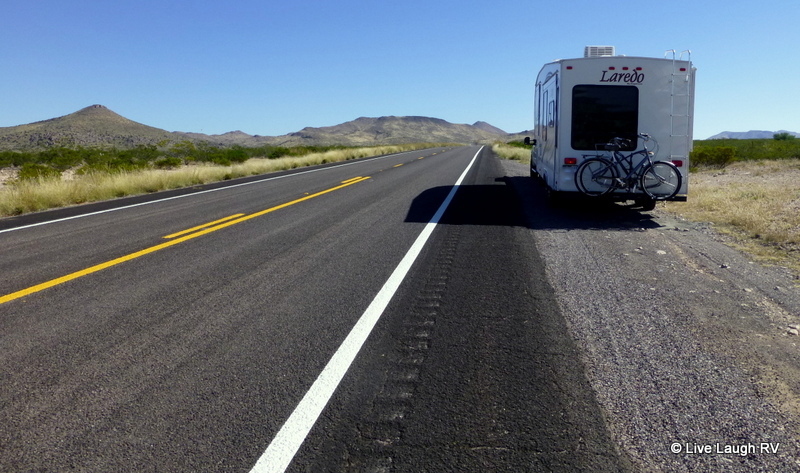 Finally, we picked up Interstate 10 in the town of Lordsburg, New Mexico. 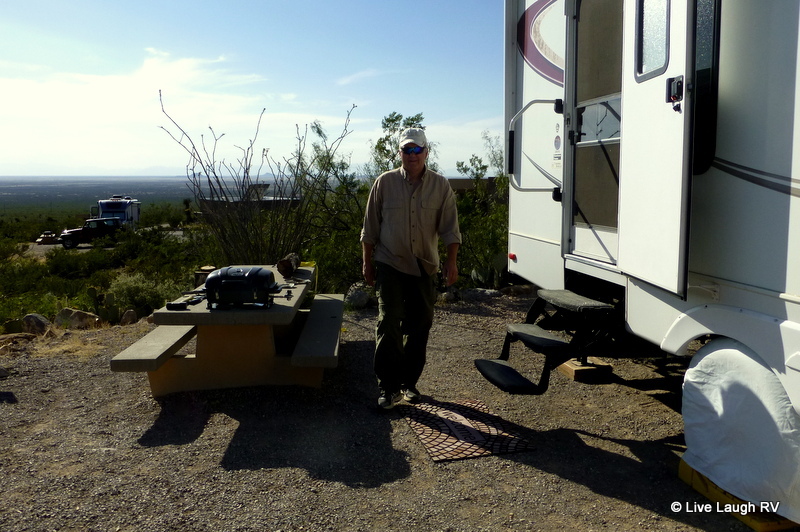 It wasn’t too long after that, we arrived at our destination: Rockhound State Park in Deming, New Mexico. And although I do feel justified in feeling paranoid about something going wrong with the truck or the RV, I’m pleased to say after a 4 1/2 hour drive we made it to Deming without incident. Knock on wood Murphy has been left behind. It’s a new day and a new journey. 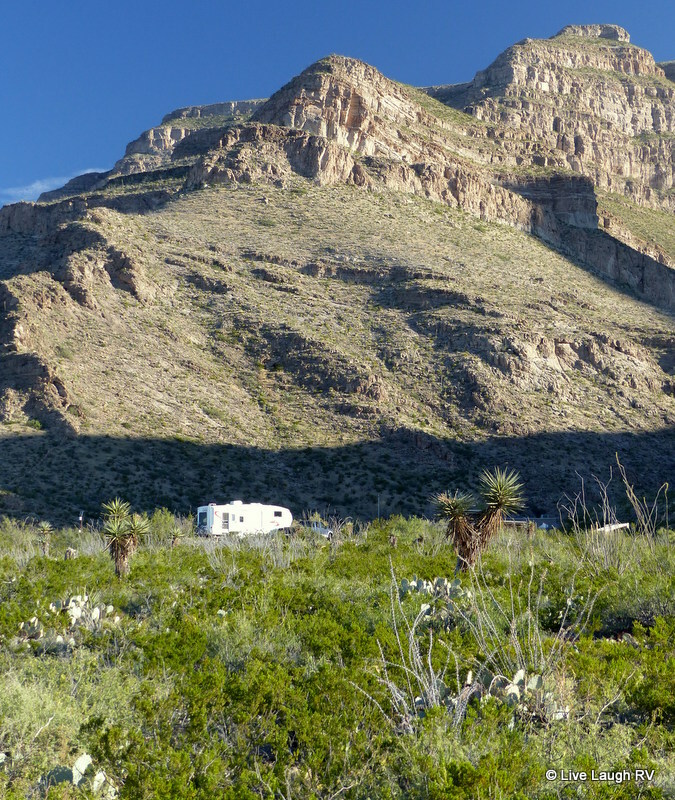 The large rear window in the RV offers an unobstructed view of the mountain and meadow to the east. As I sit in my chair drinking a steaming cup of hot black coffee, I watch the sky toward the east start to glow. It’s a cold, brisk morning in southern New Mexico. The tall meadow grasses are touched with frost. After a great nights sleep, Al and I sit in a toasty warm RV watching the sunrise. While we eat a breakfast of left over cherry pie, we wonder why anyone wouldn’t want to do this……I’m referring to the RVing thing but on second thought, why wouldn’t anyone want to eat cherry pie for breakfast while watching the sunrise? Pie and coffee with a beautiful view…..aahhh! This was the perfect overnight stop. This is our church. It’s what renews us. We savor the morning; savor the view, the coffee, the pie. Life is good. No hurry this morning. A cold morning. Trail sign coated in frost. We’re tempted to spend another night, but it’s cold and expected to get even colder. Even Al is torn. Do we go? Do we stay? With a little warmer weather, I assure you we would stay another night, but with the cold temps we move on. The RV loop offers electric and water. Dry camping available in and around the rocks geared towards tent camping. While traveling along the interstate through the sprawling city of El Paso, Texas, we glance to the south across the U.S. – Mexico border . The Rio Grande River acts as a divider between the two countries. We can easily see the city of Juarez, Mexico. It’s not a pretty sight and with a reputation of being the deadliest city in Mexico, we won’t be crossing the border here anytime soon, but being this close to the border we did encounter a random check point stop; not uncommon traveling the roads in the southwest. A border patrol stop even though we don’t cross the border! All traffic is stopped. The border patrol officer looks through the window and asks, “Is everyone on board a U.S. citizen?” We respond respectfully, “Yes”. He says, “Have a good day” and waves us on. Al no sooner has his window rolled up when he comments, “Si, Señor”. I’m very grateful his sense of humor was not released sooner or we would’ve been pulled over. 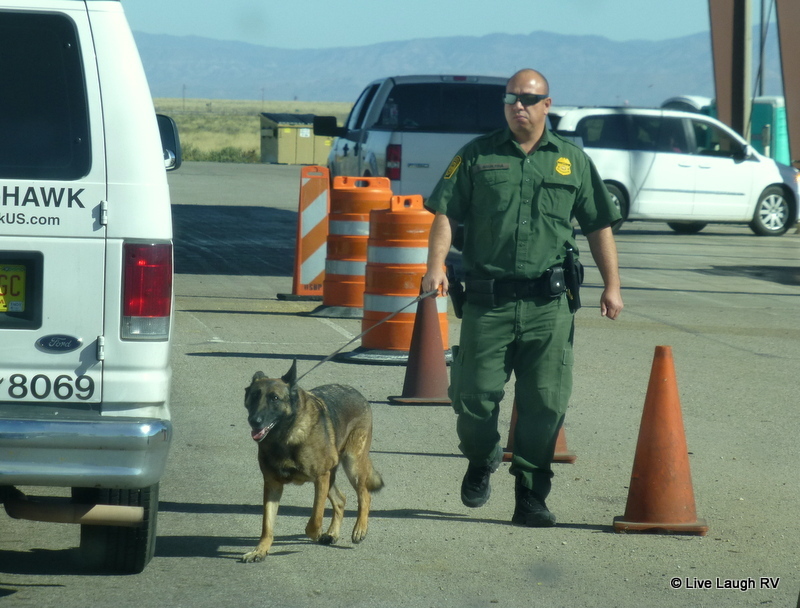 Even then, when pulling a RV it’s not unusual to be asked to pull over and an officer will board the RV checking for the harboring of any illegal aliens….no E.T. onboard in our rig. I don’t know why these stops always make me nervous, but they do. Geez, I’m not even crossing the United States border. 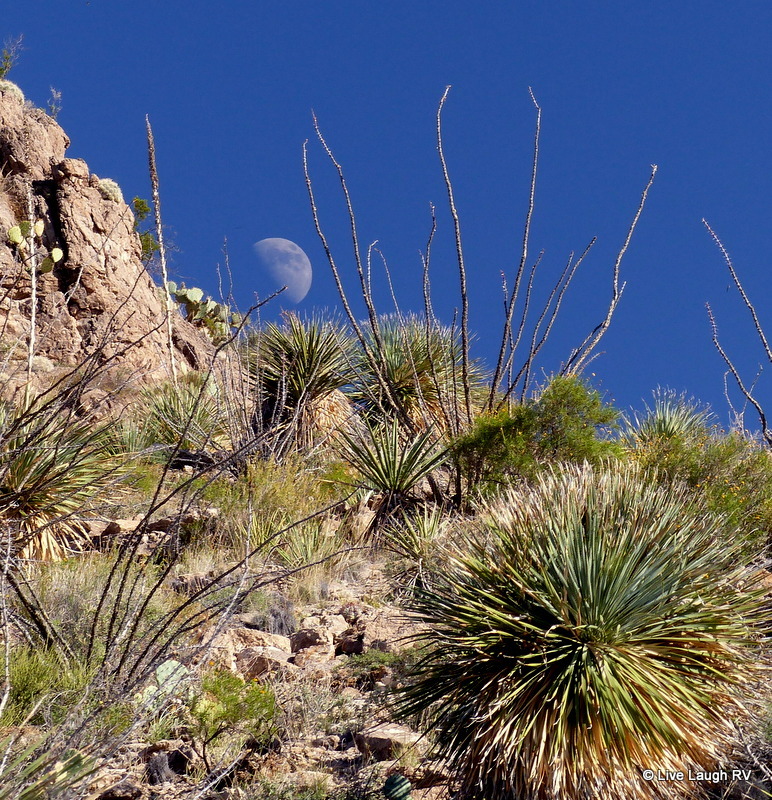 By noon, we are east of El Paso, Texas and are changing the clocks to the Central Time Zone. Looks like we just lost an hour. We have a 370 mile (587 km) day of travel planned today; from Deming, New Mexico to Fort Stockton, Texas. The drive should take us about 5 1/2 to 6 hours depending on fuel stops. 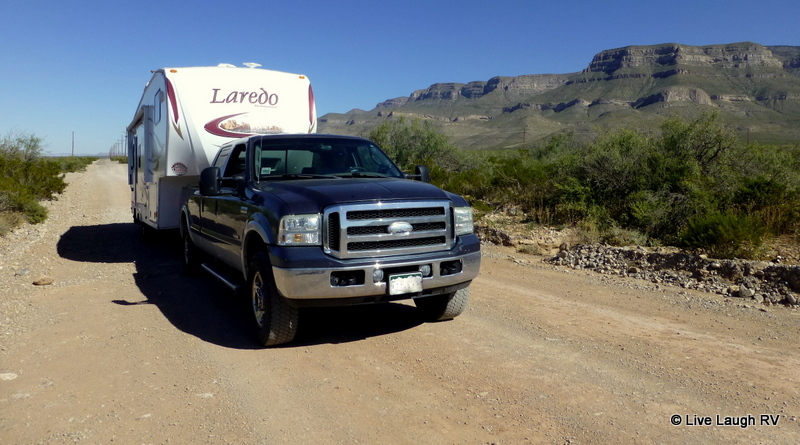 Since it’ll be a cold night, we opt to spend $25 for the night for full hook-ups and stay at the Hilltop RV Park in Fort Stockton, Texas. Tomorrow will be another 5 hour drive. Texas sure is a BIG state! Do I see a bunny rabbit? The drive allows us plenty of time to reflect on our journey the past couple of days. 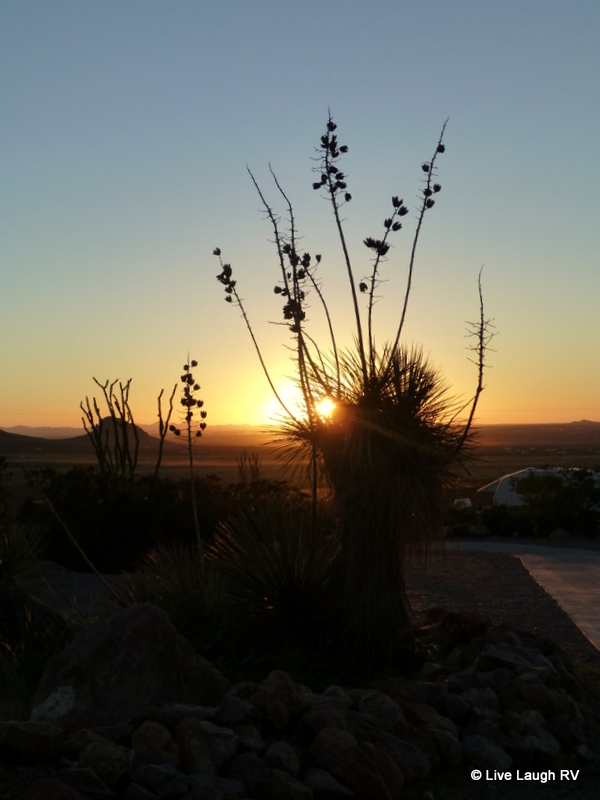 We love meeting fellow RVer’s and discovering hidden gems like City of Rocks State Park. 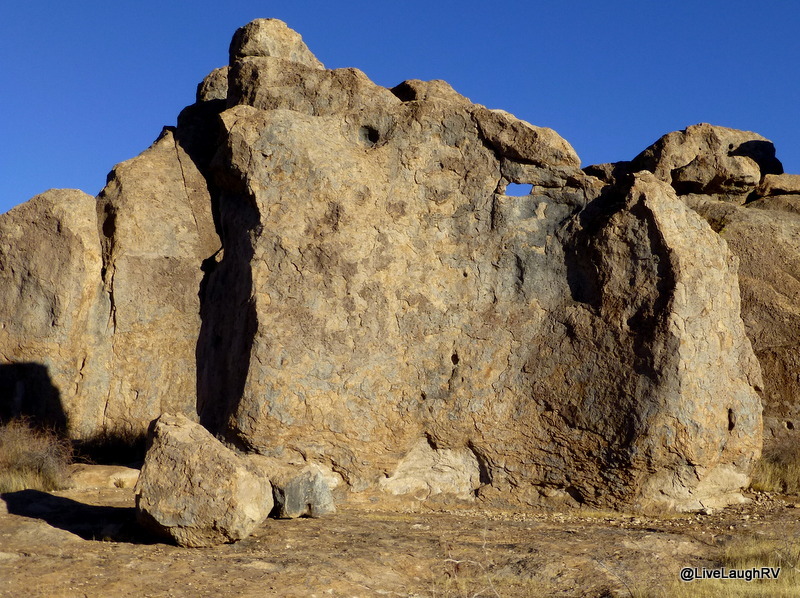 So many of the rocks created unique shapes….. many of which I have chosen not to post since my blog is rated ‘G’. Although I can’t promise after a couple of margarita’s that I won’t do a post on phalluses. For now, I’ll stay with a Sesame Street theme and share the letter ‘d’.